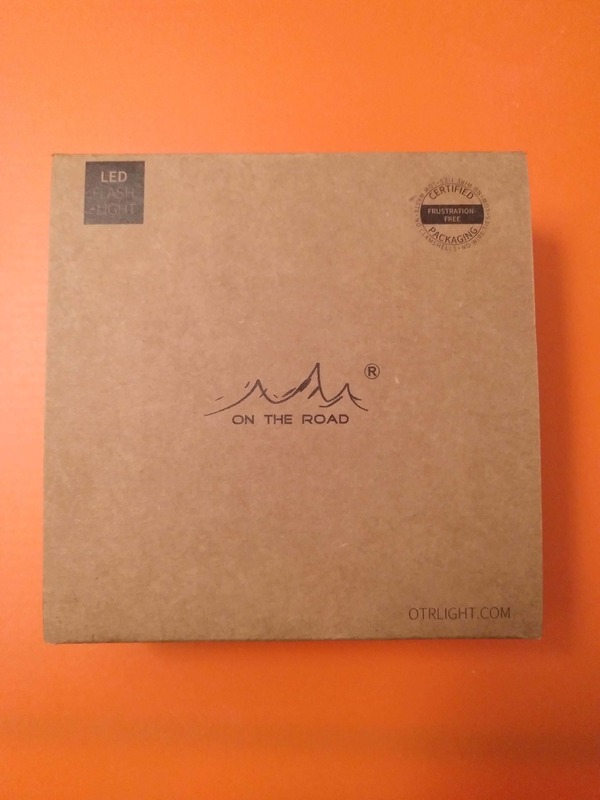 In the last months, I contacted the On The Road store in AliExpress to check if there was any update on these lights and…guess what, there was. A new model was on the forge and was released in October, if I remember correctly! 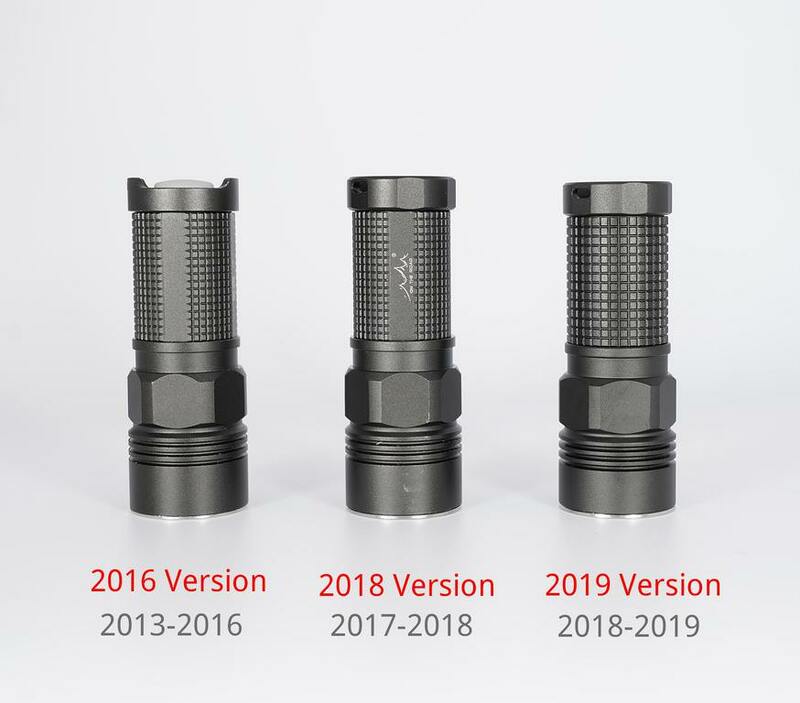 There are 2 versions, one with the charger kit, and other without! I bought the one without! 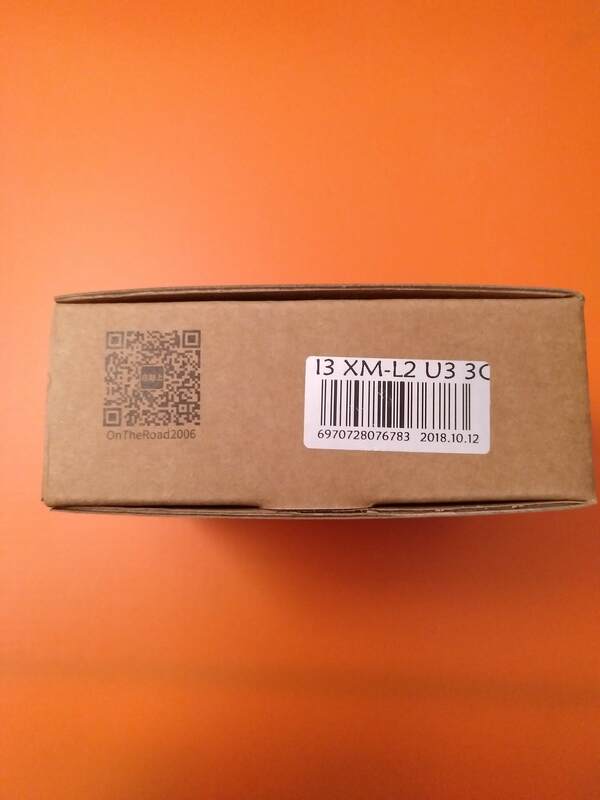 The On The Road i3 arrived in a OTR branded cardboard box, that protects really well its contents, and that is similar to the one of the OTR M1 and the OTR M3! 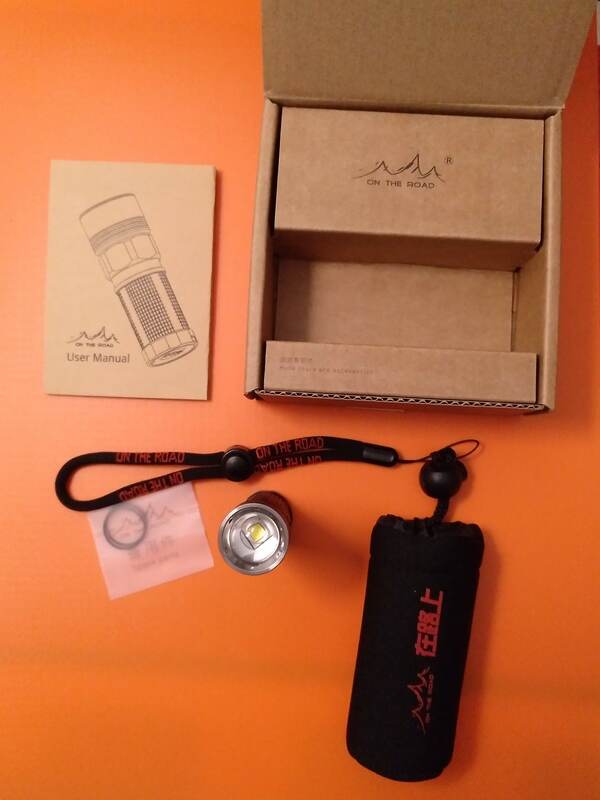 On the side it has a sticker indicating the model of the flashlight and type of LED that we will find inside! And what’s inside the box? 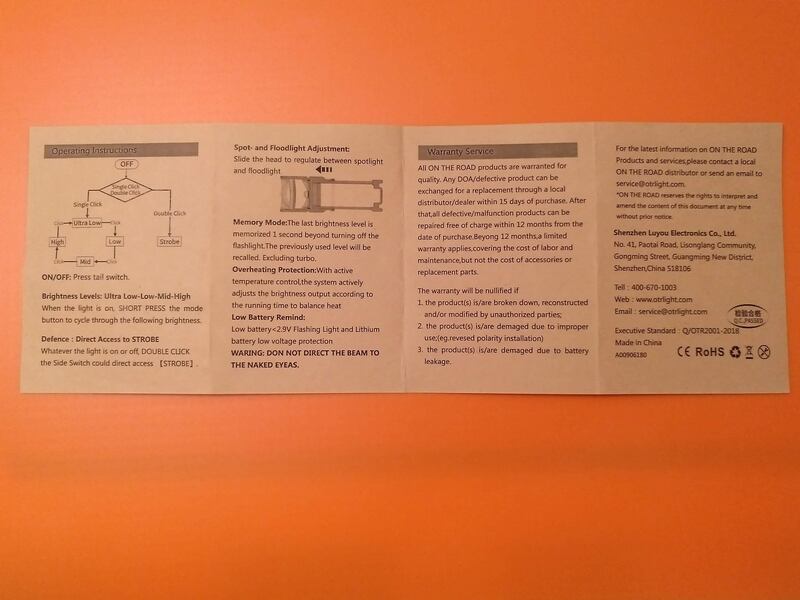 Well, in this package I found the: OTR i3, 2 O-rings, the User Manual, a Pouch and a Lanyard (OTR branded). 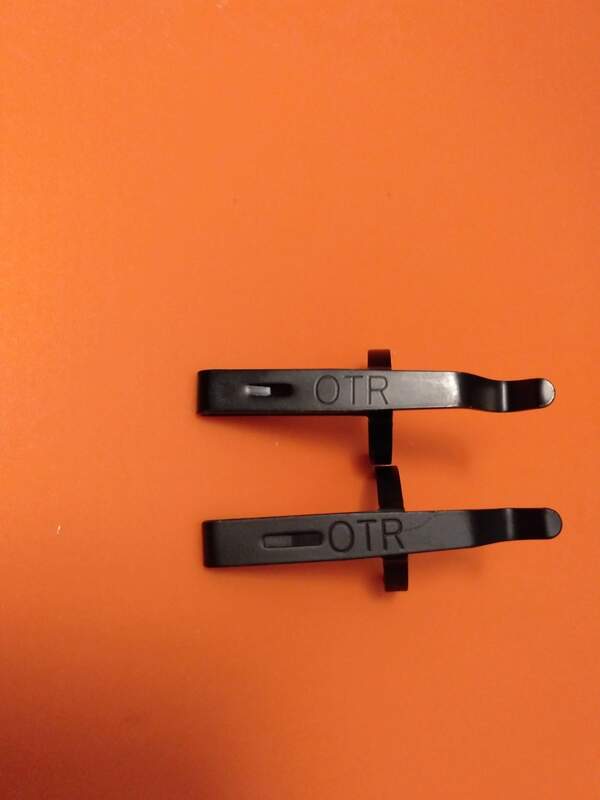 The representative of OTR offered me some other accessories, which I will show later! 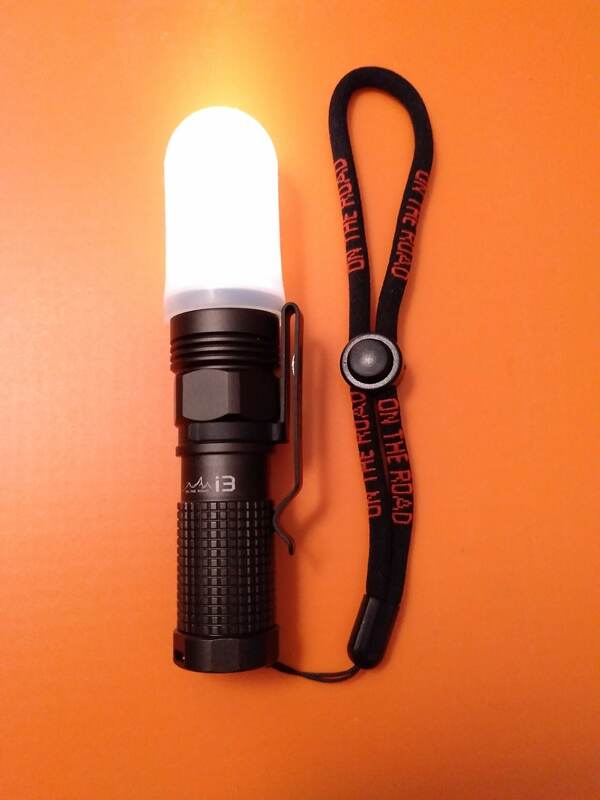 The OTR i3 is a push-pull zoomable flashlight that uses CR123/RCR123A/16340 batteries. 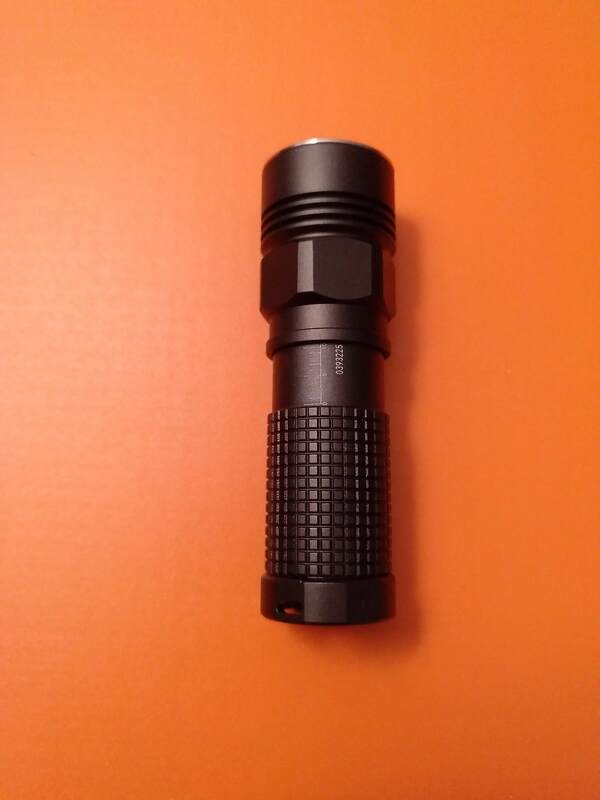 It is a small flashlight, with “titanium colour”, a square “chocolate” knurling in the body, an hexagonal shape in the pill area, and also some fins in the head. 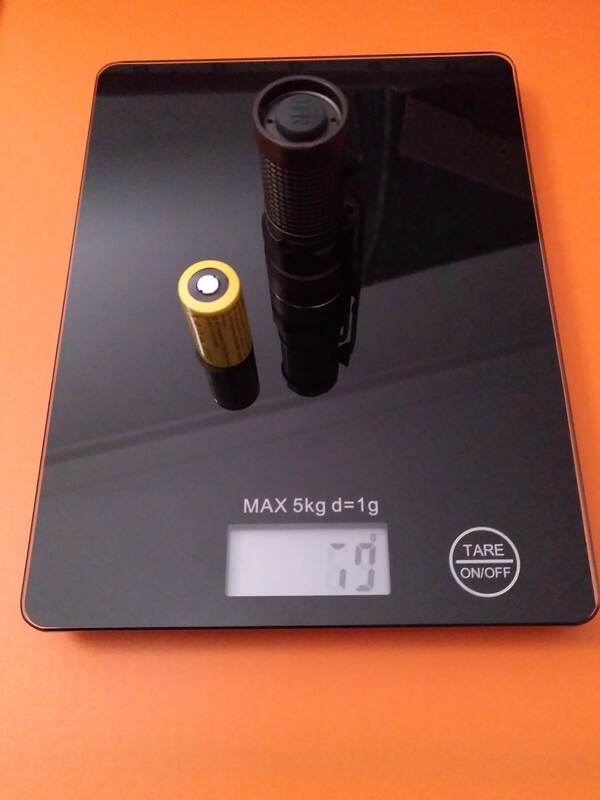 In the “neck” part, it has 2 marks: on the one side, the brand & model of the flashlight, and on the other side, a kind of “rule” with 1 cm , corresponding to the length that the “head” can be pushed/pulled! 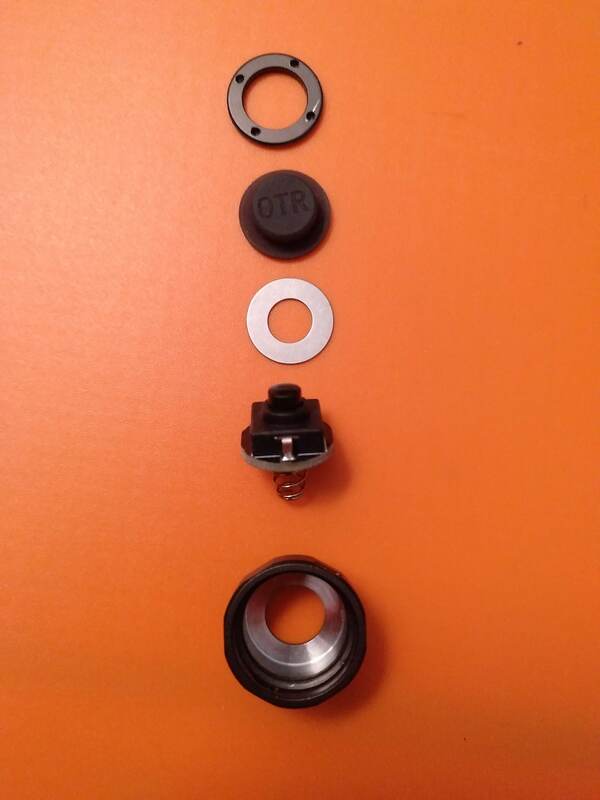 As can be seen here, in the bottom we have an OTR branded tailcap (silicone), 2 lanyard holes, a 4 small holes on the external retaining ring (through which we can access the reverse tail switch). 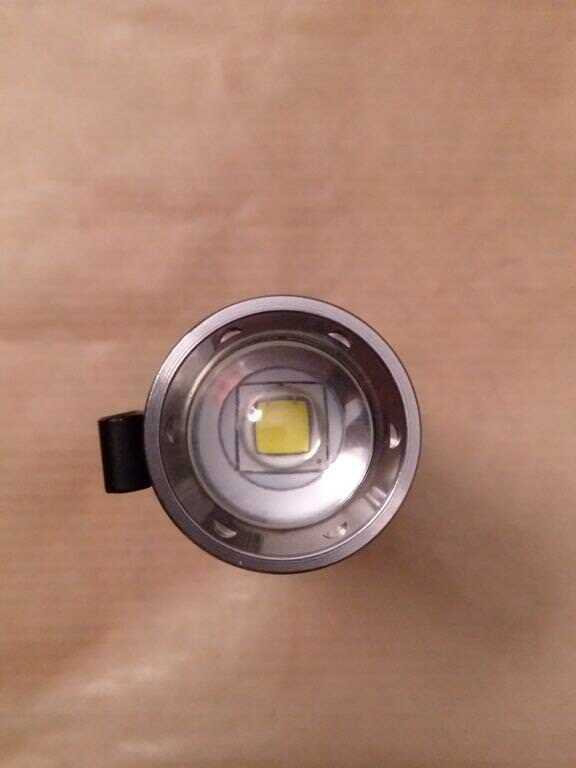 In the head, a stainless steel bezel with some grooves, the optical lens and we can see the XML2 Led. 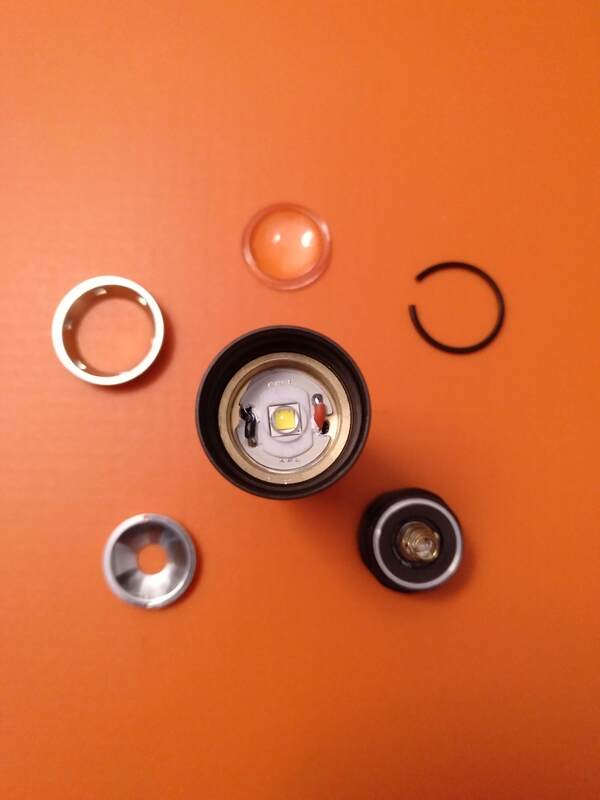 Disassembling the flashlight what do we find? 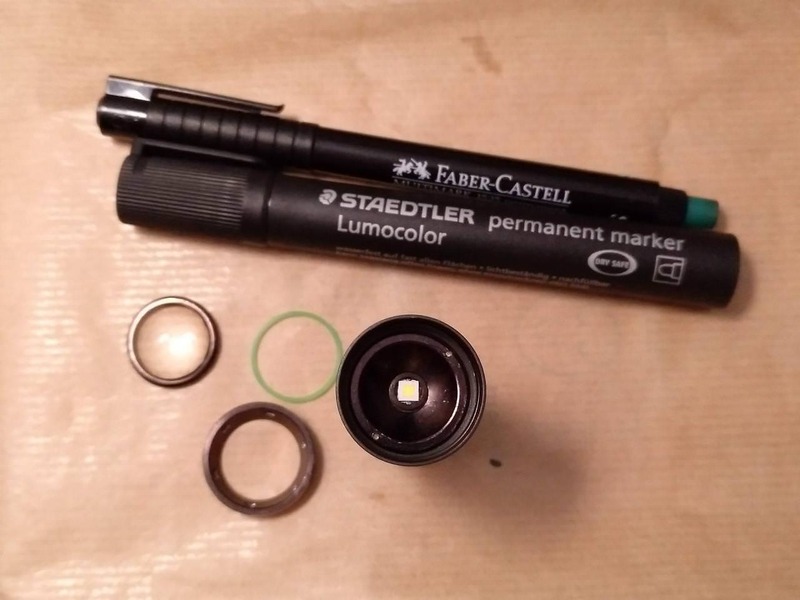 Starting by the top: stainless steel bezel, the glass optical lens, a thick –cut- o-ring / cushion, the smooth “reflector”, the led plate and emitter, brass pill. When the head was disassembled, a thinner o-ring popped-up from the inside, which helps on sealing the neck/head when pushing/pulling it! 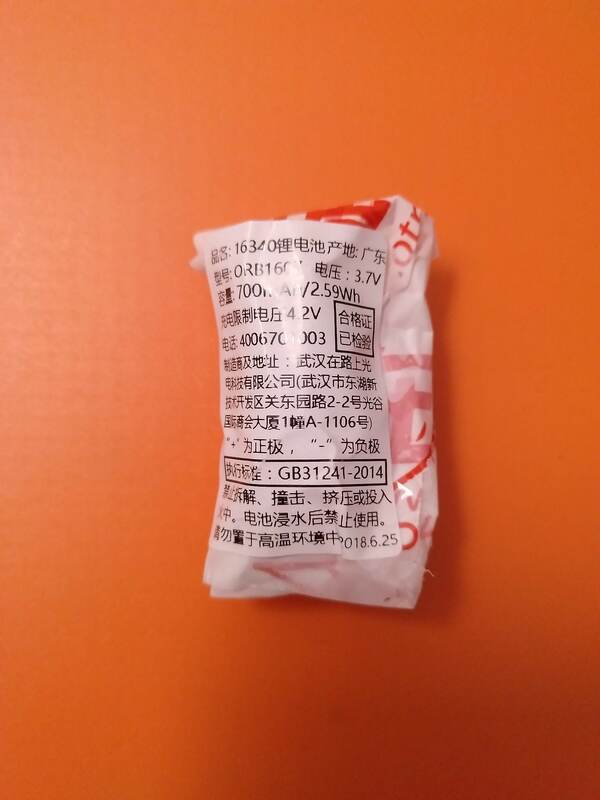 The PCB is aluminium, and below it there is white thermal paste. 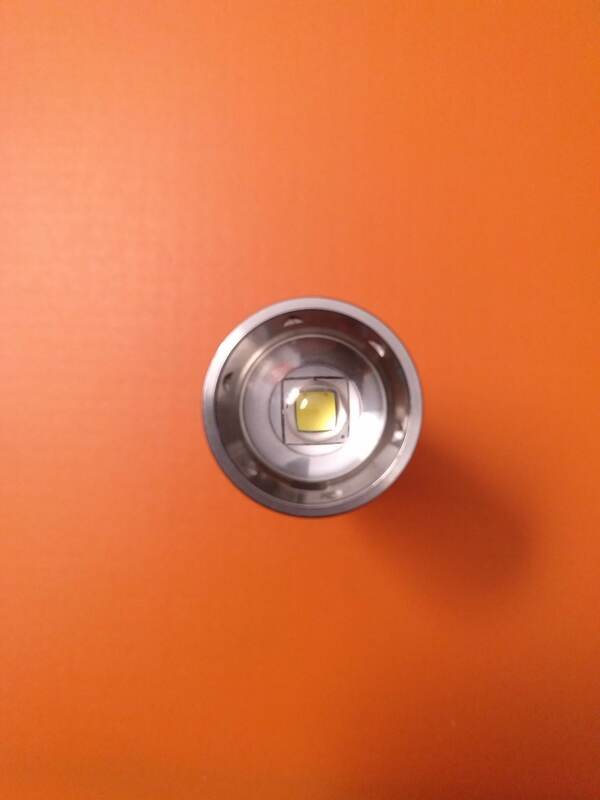 The LED is involved by a white gasket that doesn’t protrude much above the reflector basis (therefore avoiding some reflection artifacts on the beam). 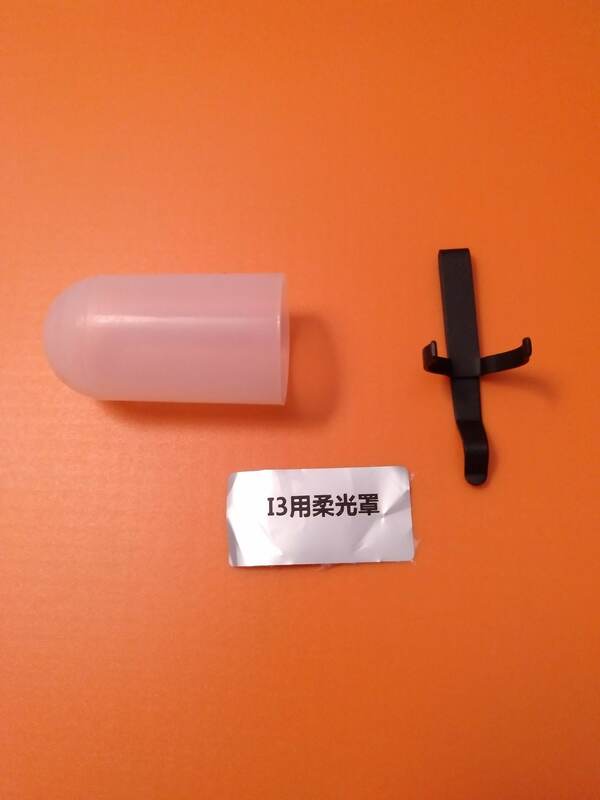 The ”reflector” is screwed into the pill and can be disassembled, using some force. 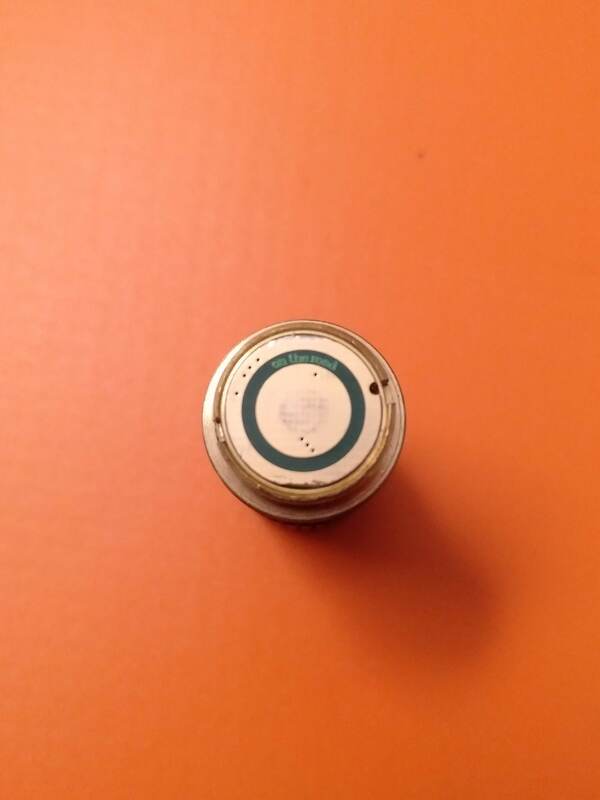 It sits on the white gasket avoiding contacts with the driver’s wires (what would probably provoke a short-circuit). 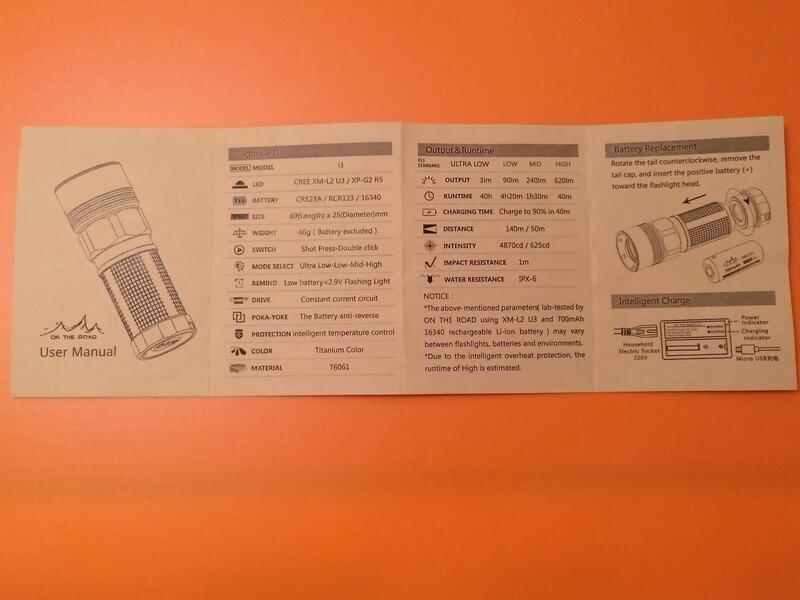 A short look into the lens! 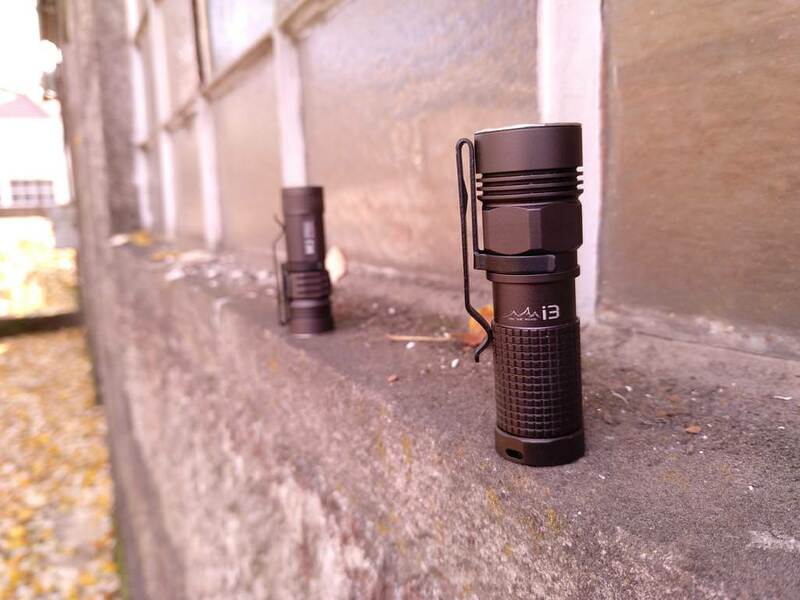 It is very well made, seems to be scratch resistant (unlike the plastic/acrylic lenses) and gives confidence when using the flashlight! 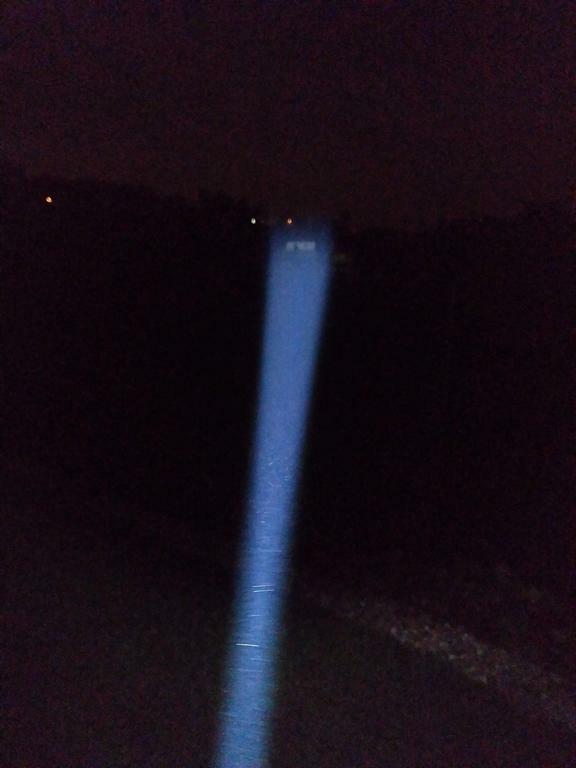 Also,I believe it has a positive impact in the beam. 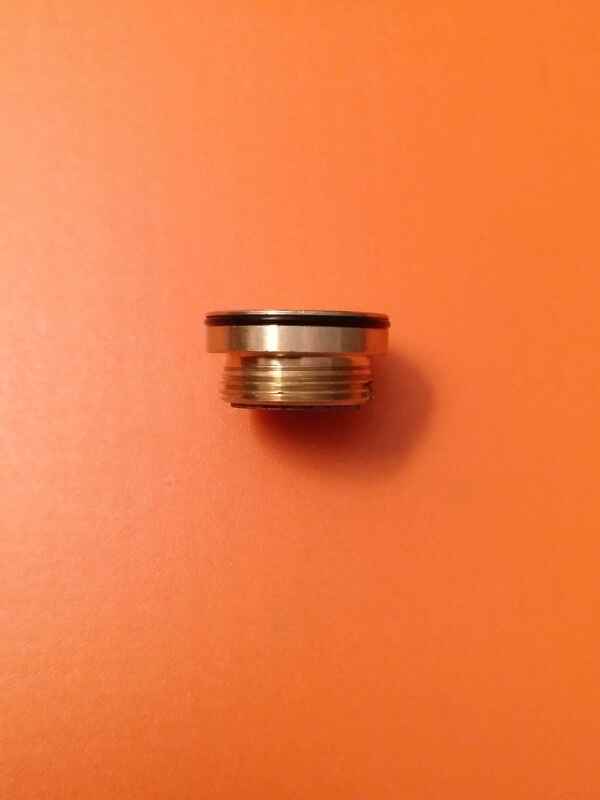 About the pill, it made of brass, has an integrated shelf to support the emitter plate. 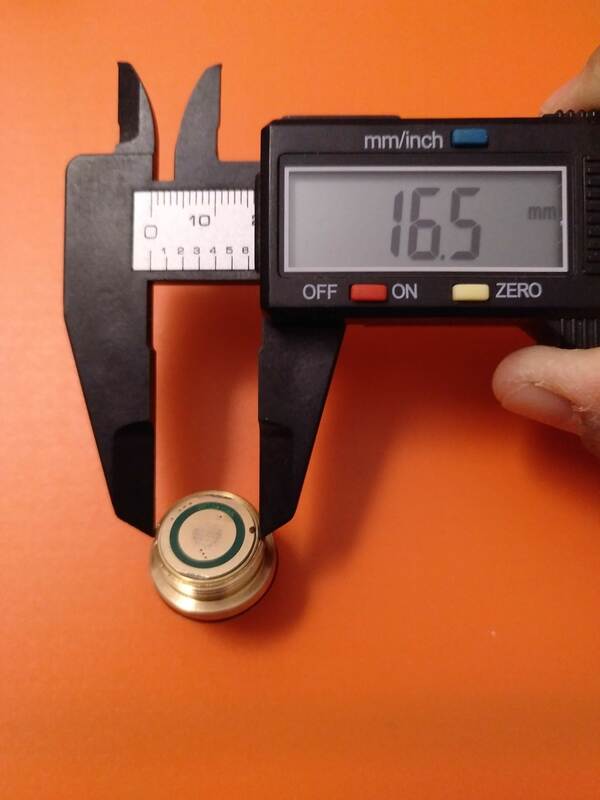 On the bottom, the 15mm driver is surrounded by a brass retaining ring. 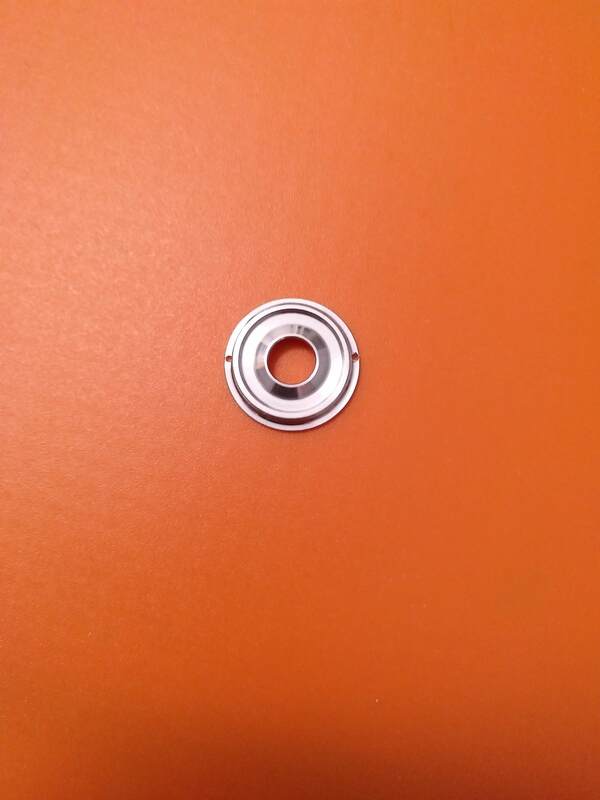 There is a sealing o-ring that helps sliding the head up and down. 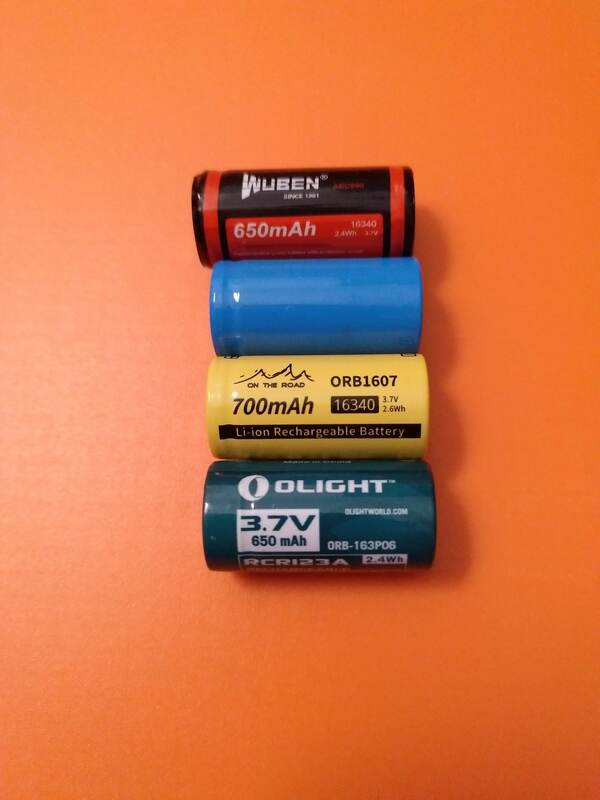 The pill is screwed into tube battery tube! 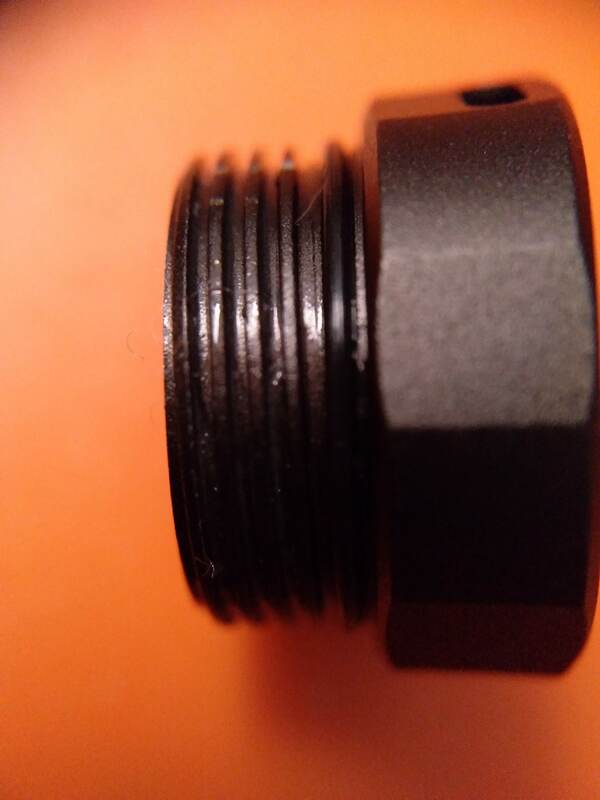 I had to use some thin tweezers to be able to (un)screw it again. 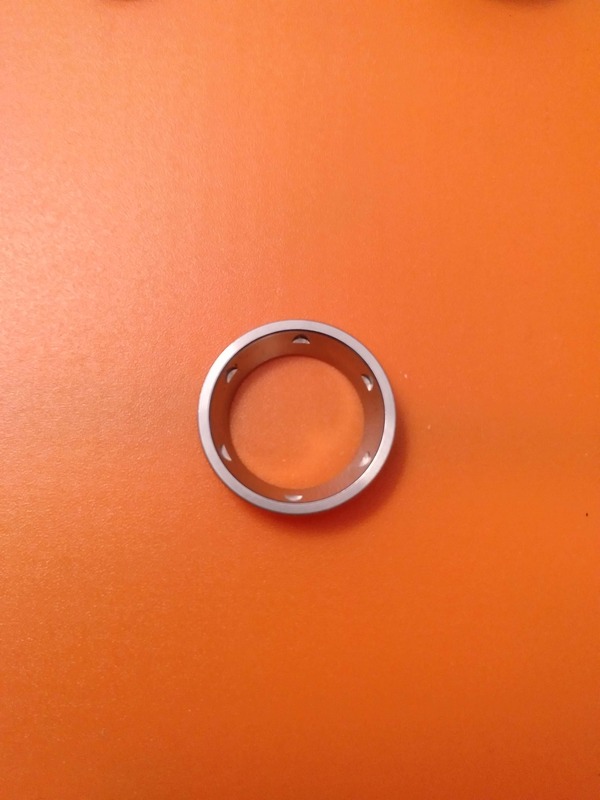 It is well machined, no flaws nor aggressive edges! 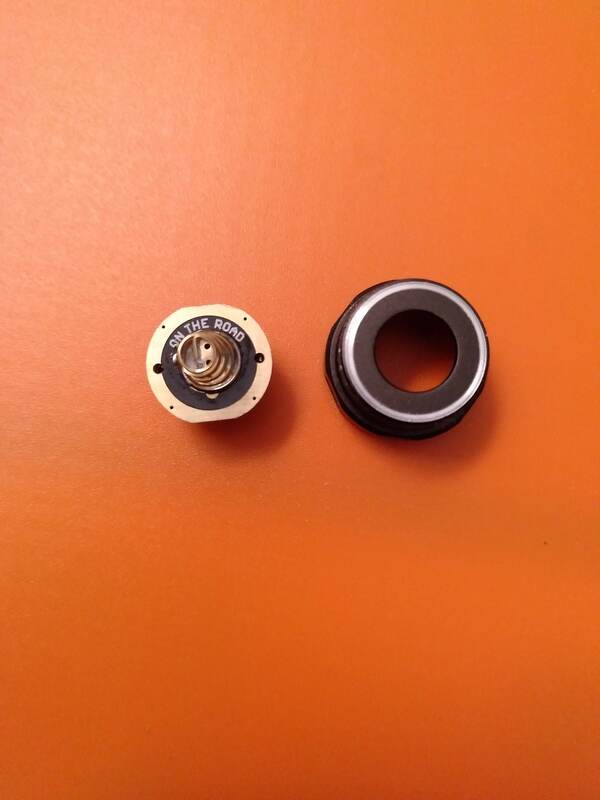 On the bottom (tail), we will find a silicone OTR tailcap, held by an (un)screwable retaining ring that gives access to the reverse switch with a OTR branded PCB. The tail is detachable by unscrewing it from the body. 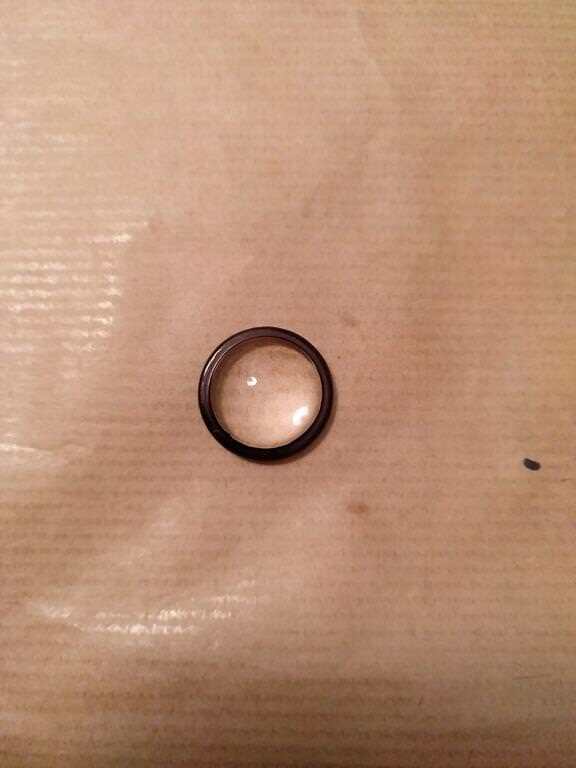 The threads are square and arrived well lubricated. There is a sealing o-ring on the tail! 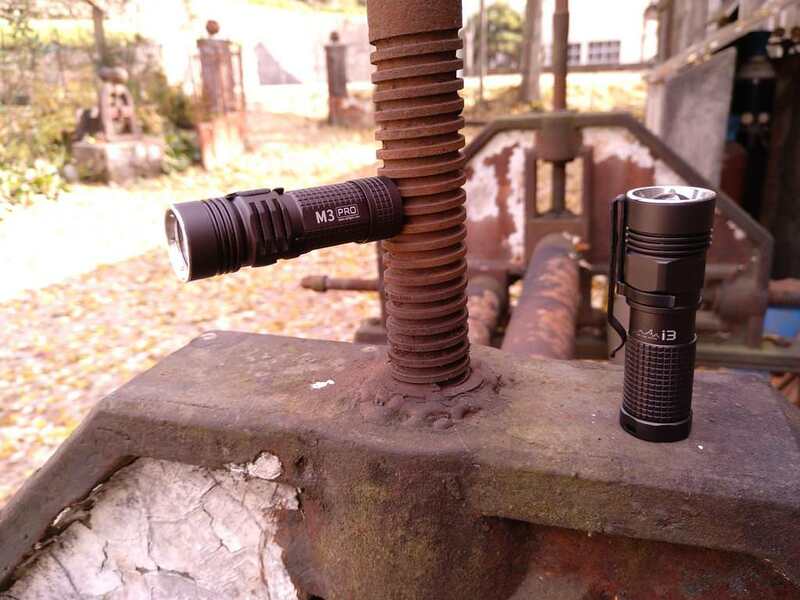 The overall feeling about the flashlight is that it is incredibly well made, no machining flaws, a very nice feeling in touch. The push/pull is soft, and can easily be done by just one hand (some zoomies are difficult to slide…). 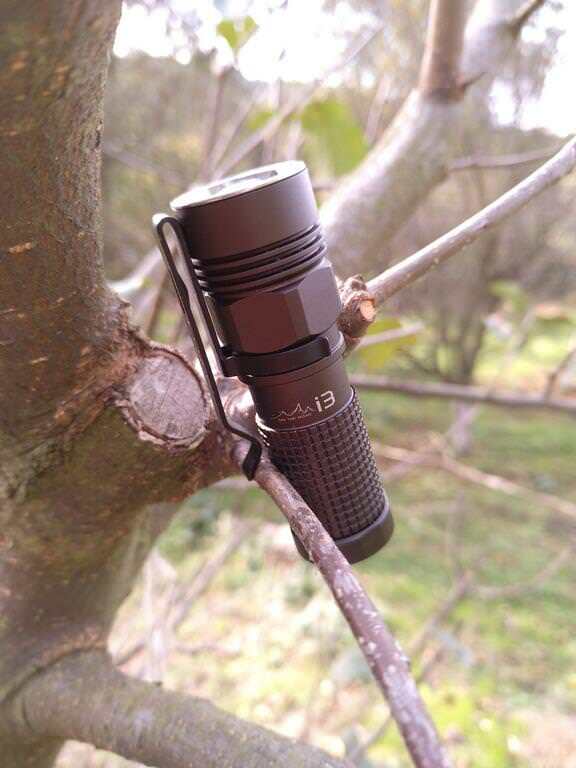 Also, being a small flashlight it fits well in the hand, with or without lanyard or pocket clip! 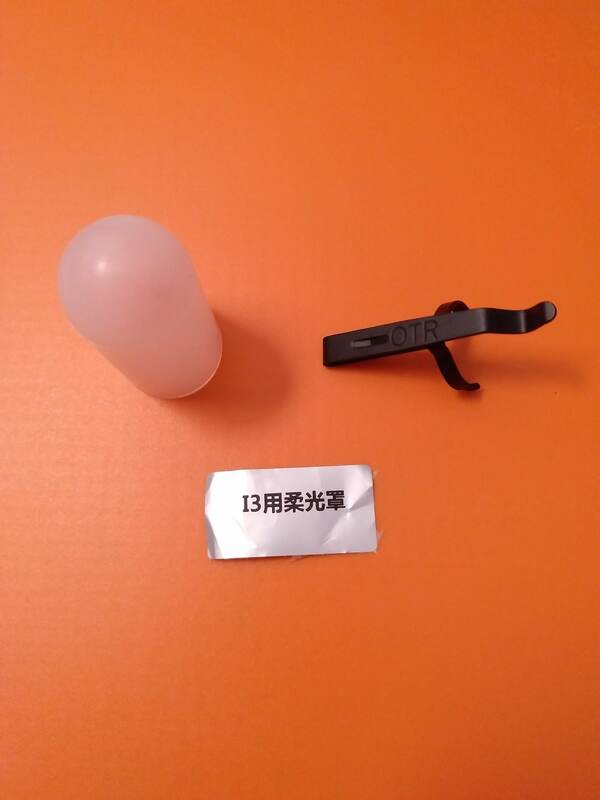 I was sent a silicone diffuser and a pocket clip that can be bought separately from the available packages (as far as I can tell). 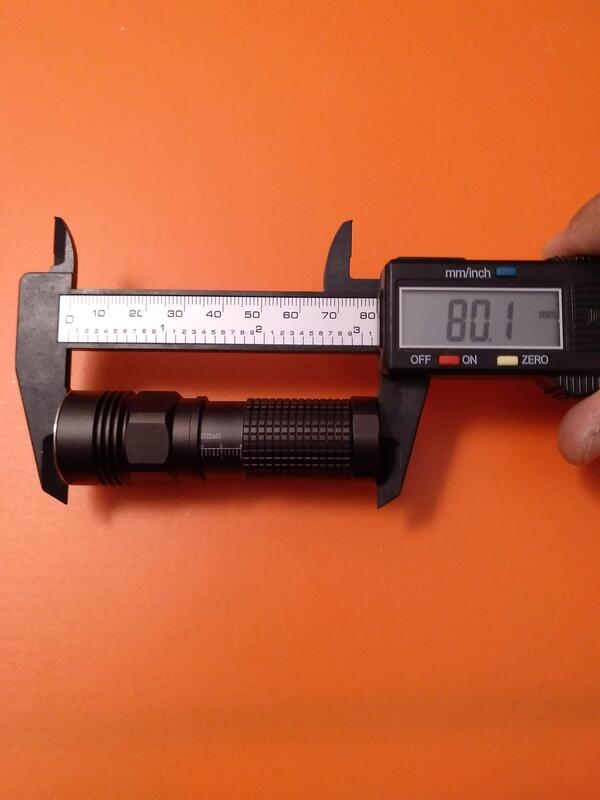 To end this part, here are some physical measurements of this flashlight! 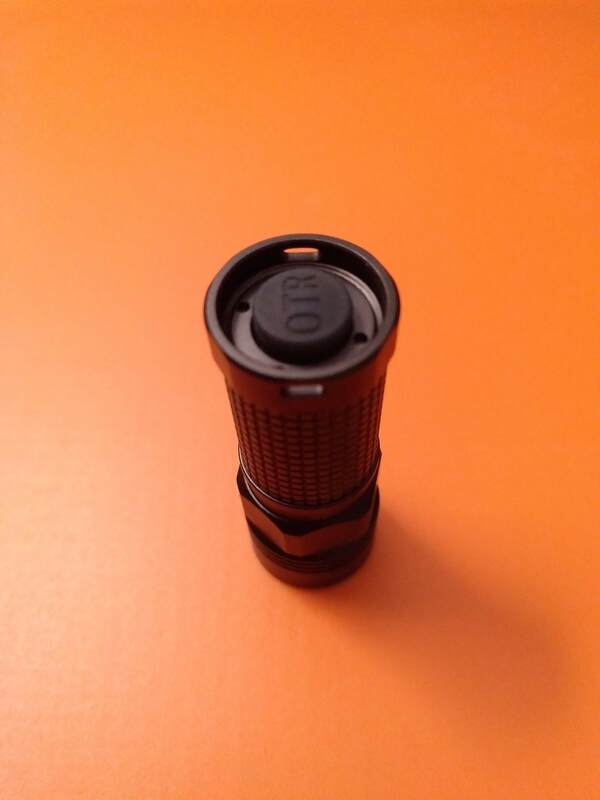 About the UI, this flashlight is quite simple, in my opinion, but it has some specificities!! 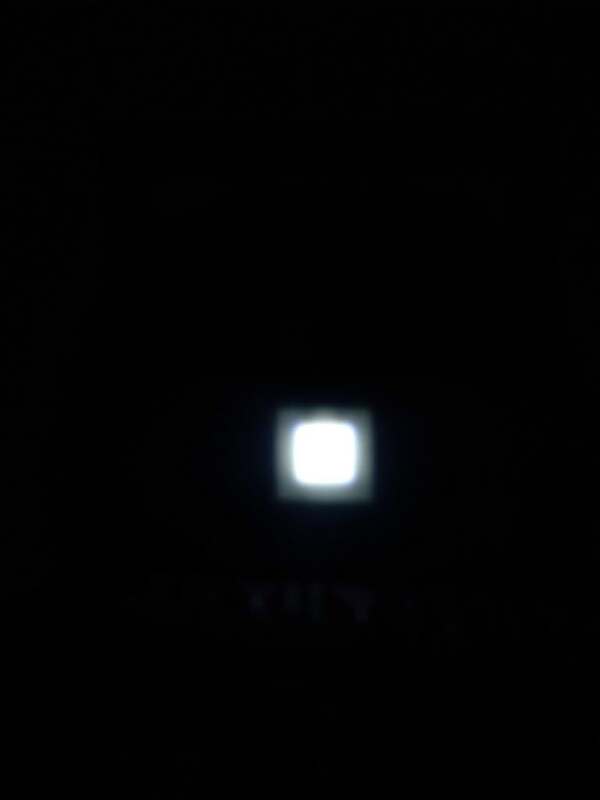 - When in Strobe: Half press to return to the previous mode. 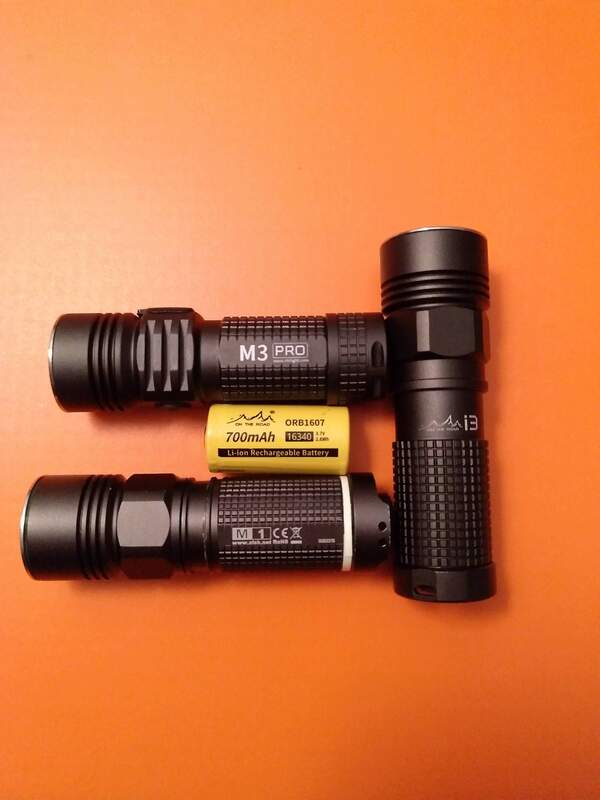 As stated in the User Manual, the output tests were made with a16340 battery and XML2 U3 Led (probably U3-1A, Cool White), so it will change according to the LEDs used. 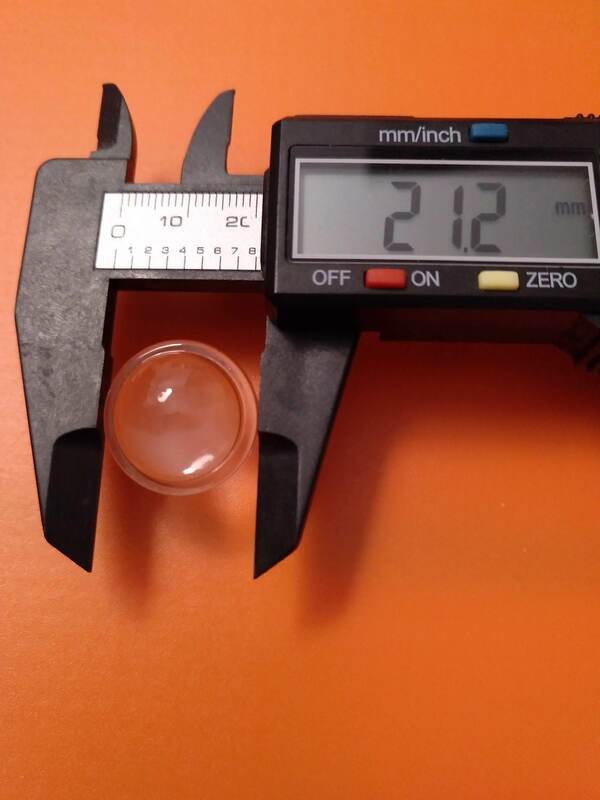 It is probable that the output will reduce with time due to the temperature protection integrated in tge driver! 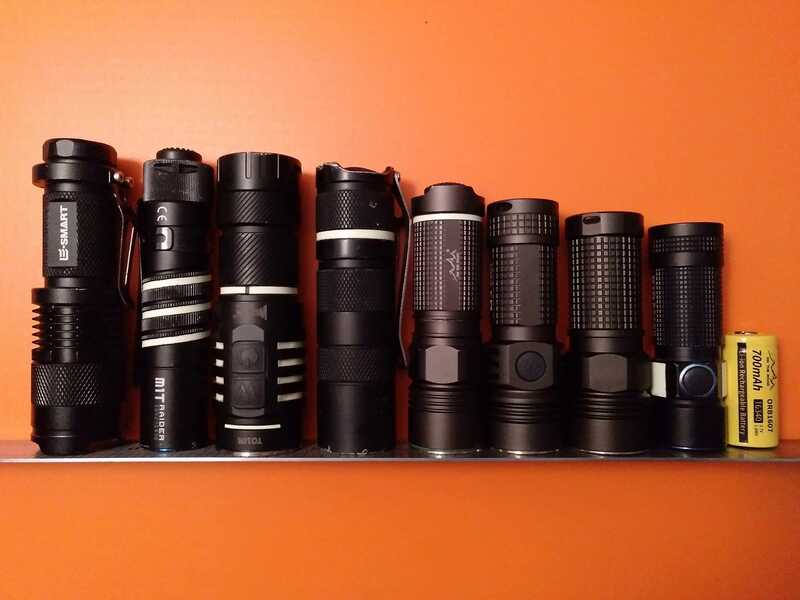 Some flashlight comparison, with the OTR family and with other flashlights!! Later on the weeked I will post some more on post #2! 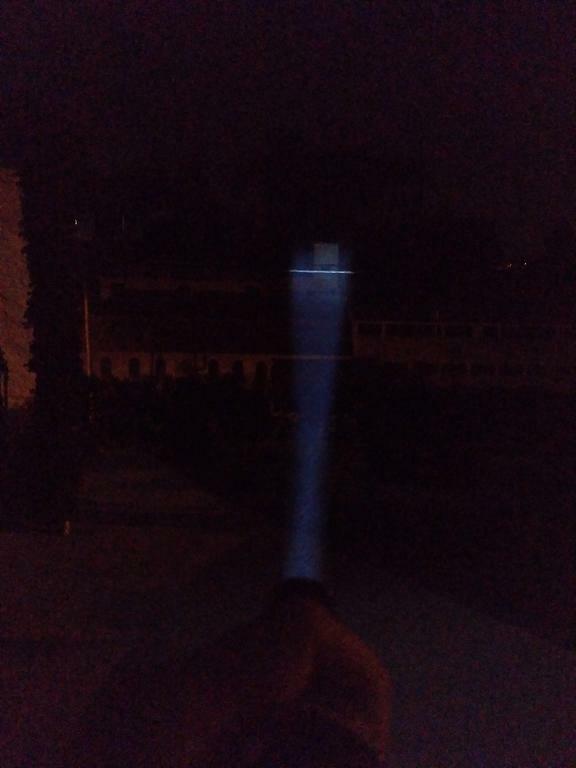 And now a quick check on the beam pattern with the flashlight zoomed in and out! 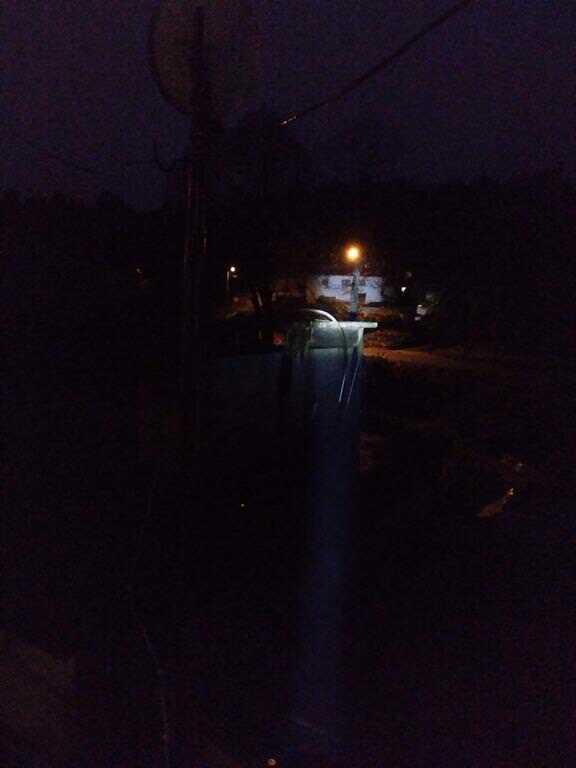 AS can be seen here, the modes are well spaced and it can be seen that there is a clear beam ! 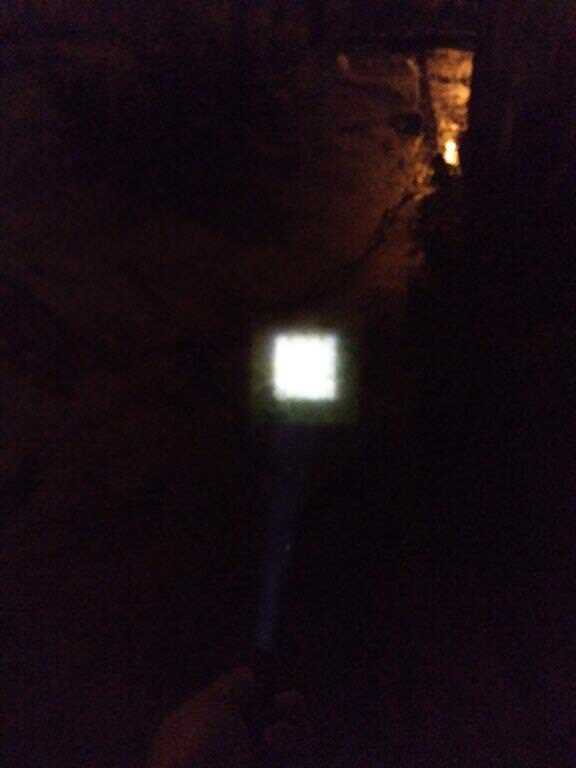 There are always some artifacts due to the reflection of the bezel and other things, but it is a clear beam! First, over an orange background! Then, on a white wall! 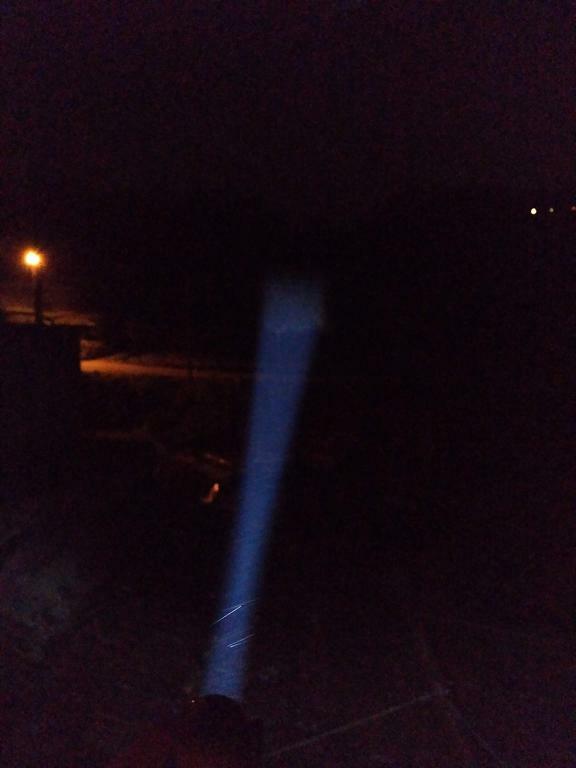 And some indoor beamshots I was able to take, zoomed out and zoomed in! 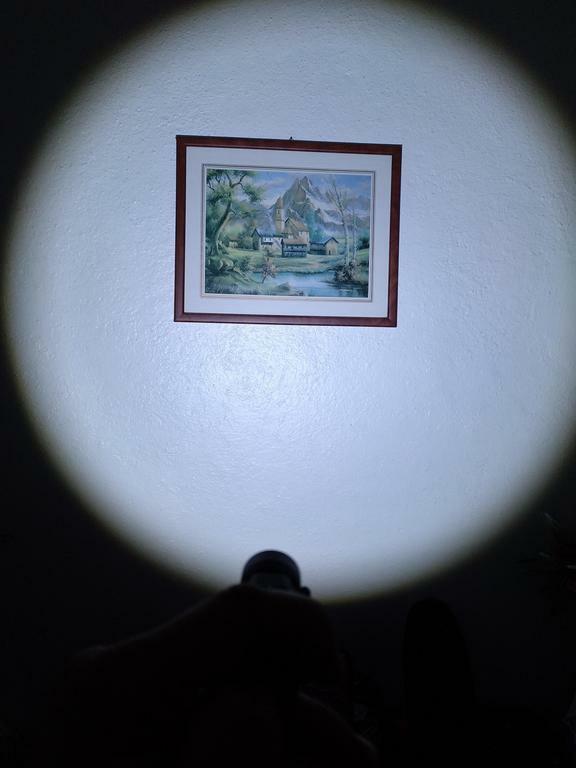 More will follow outdoor, to give an image of the distance covered by this flashlight! 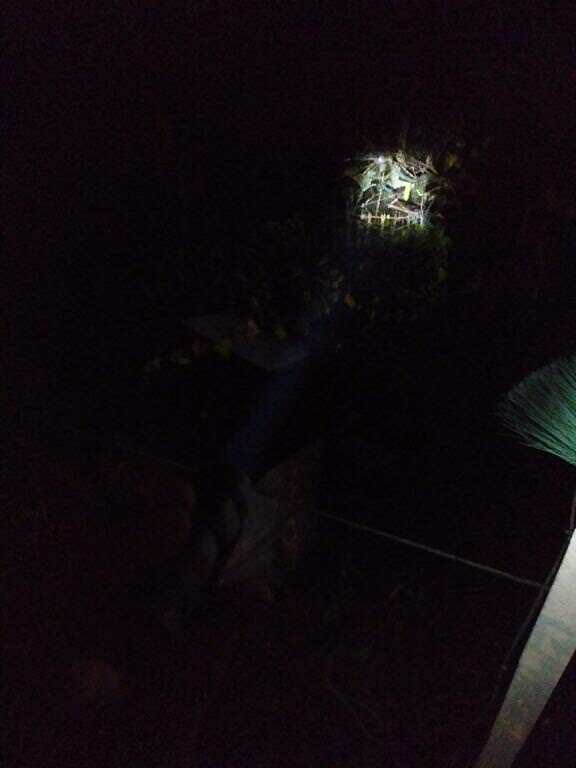 Here they are, in different distances, sometimes due to the zooming function, to give a notion of what does it reach or not! 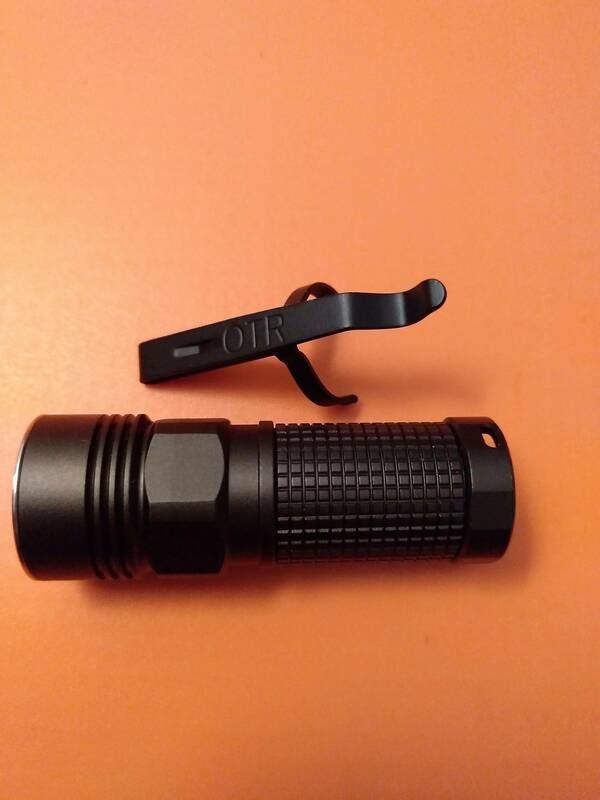 Having used the OTR i3 2018/2019 version for some days now, what do I think of it? The pros and cons! 1) Overall built and quality. 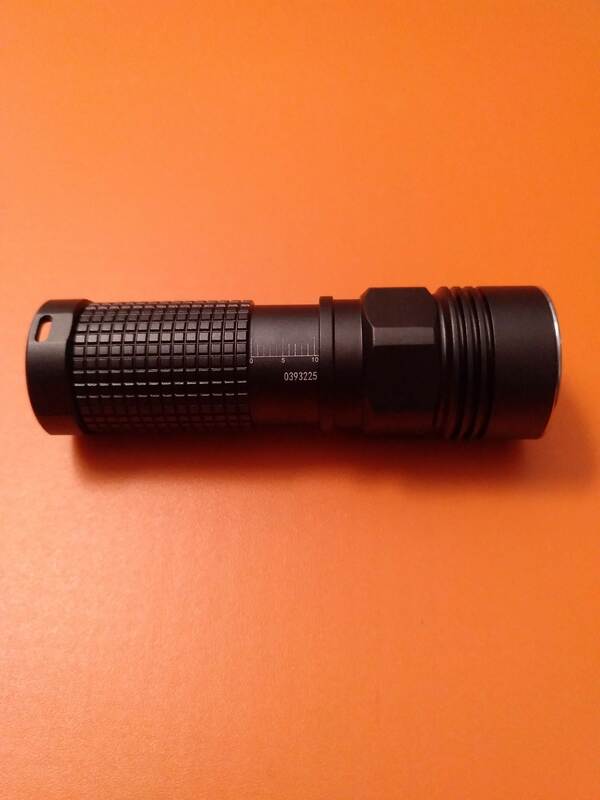 Really, this is a very well made flashlight, since the machining, anodizing, lens, switch, internals, accessories!! 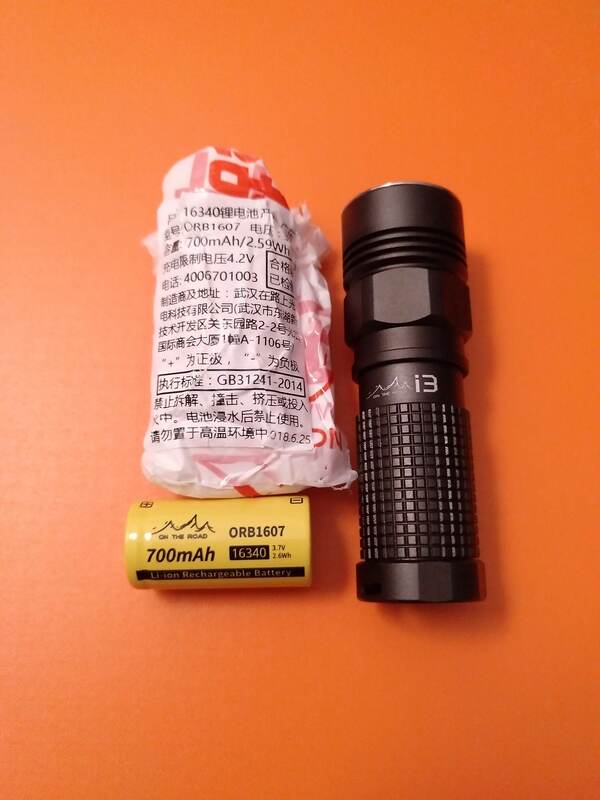 Despite being a small flashlight, it is not a “cheappo” zoomie; on the contrary, it packs a lot of quality! 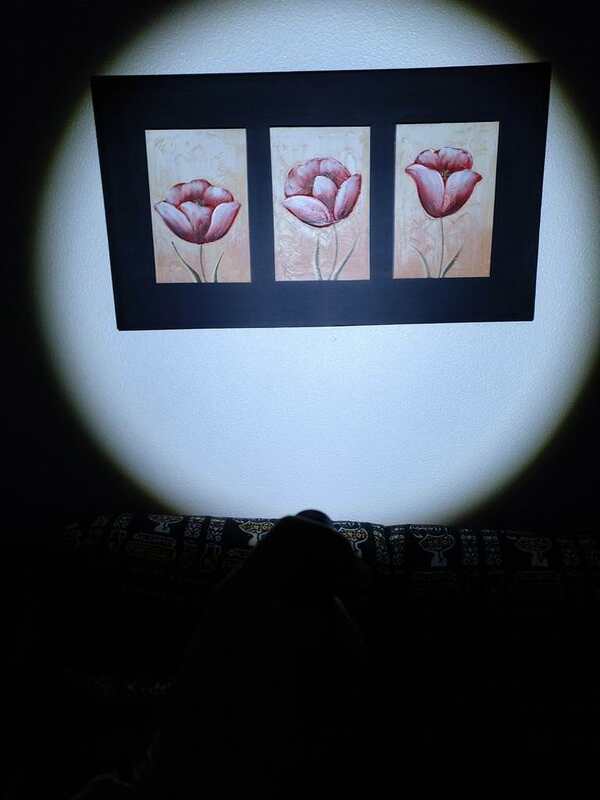 2) The LED tint. Well this was a personal request and a favour, but I like the 3C tint, a neutral white that suits most of the occasions and that even losing some throw when zoomed out (probably, if compared to XML2 U3-1A), it gains quality on close ranges ! 3) The accessories. 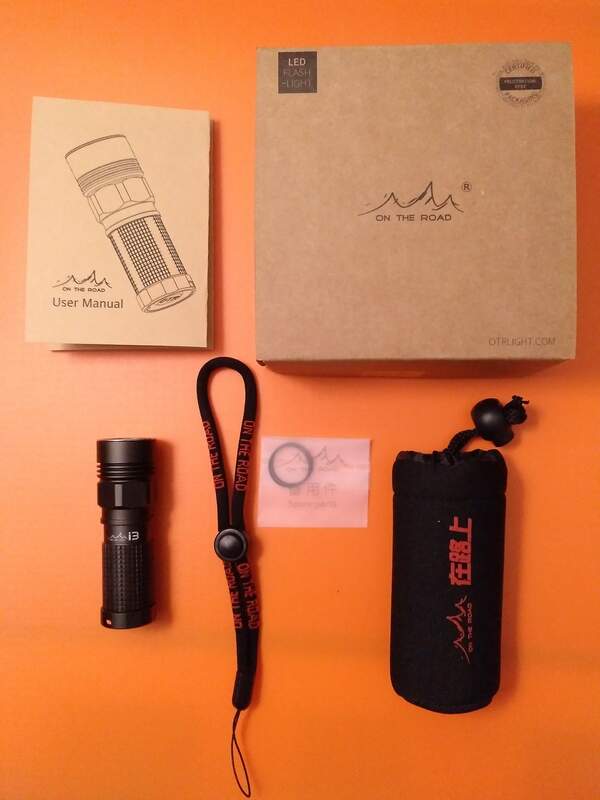 The pocket clip, the pouch, the lanyard, the battery, the diffuser, all nice accessories that deliver this flashlight and the overall package a more versatile and usable character in different situations. I really wanna thank OTR store/seller (ai ) for sending them! 5) The size! 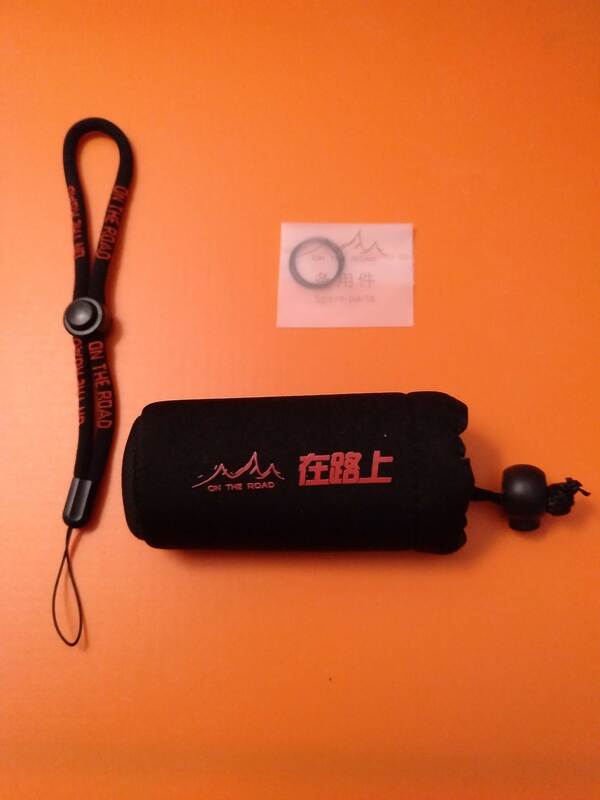 One of the main reasons I bought it was for size, and this is quite small and ergonomic, and can be easily operated due to that, namely zooming with one hand only! I couldn’t ask for more!! 1) The User Interface, in 2 aspects! 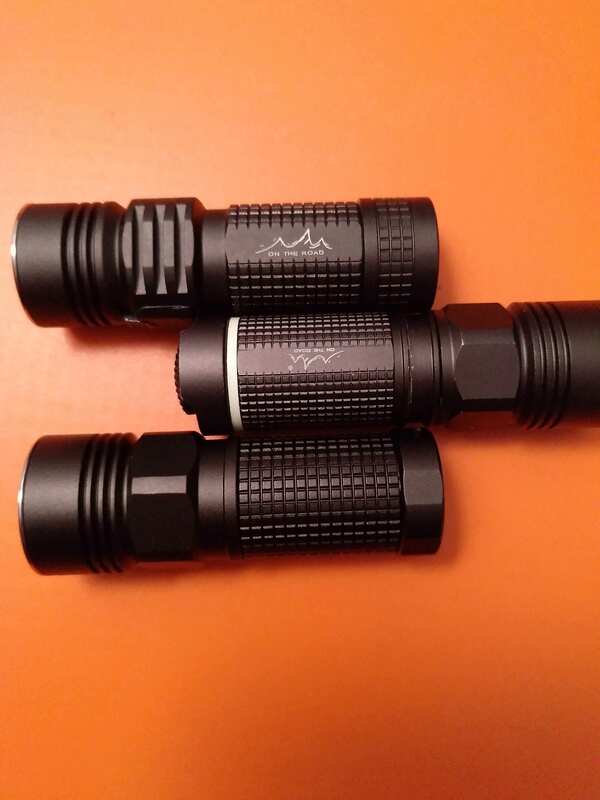 And these would be my only changes to improve the “stock” quality of this flashlight, knowing that it is not a “flashaholic”-only flashlight, but it is made for general users. I would remove mode memory making it always start on the lowest mode (this is a very personal preference, of course), and I would replace the Strobe by Turbo with double click (and eventually put Strobe with triple click if it was really necessary )!!! And that’s all for now! Any questions or comments, let’em come!! 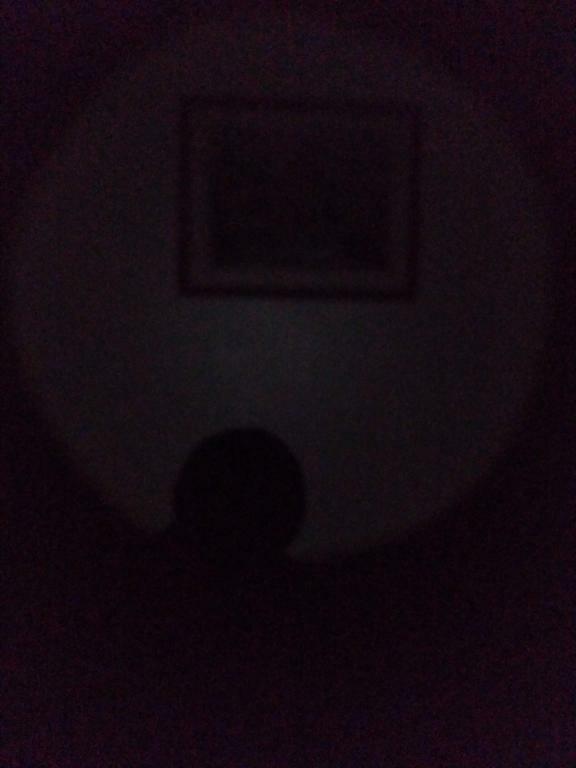 It surely loses some lumens when zooming out, of course, and that can be seen naked eye! 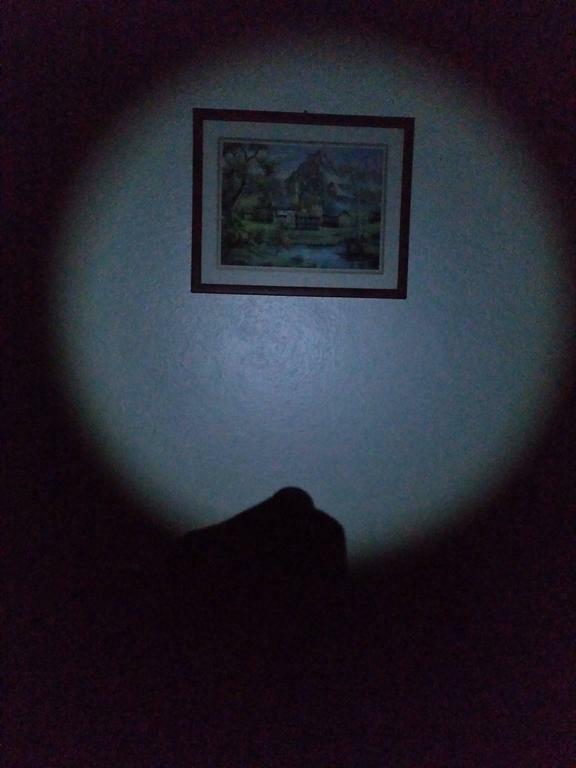 I normally don’t care much about numbers as well (unless to have a “relative” percpetion or the general output vs my needs), as I will use the light according to space it will light, close or distant! How good is the lens? Does it throw well? Has anyone put a white flat in their i3 already? 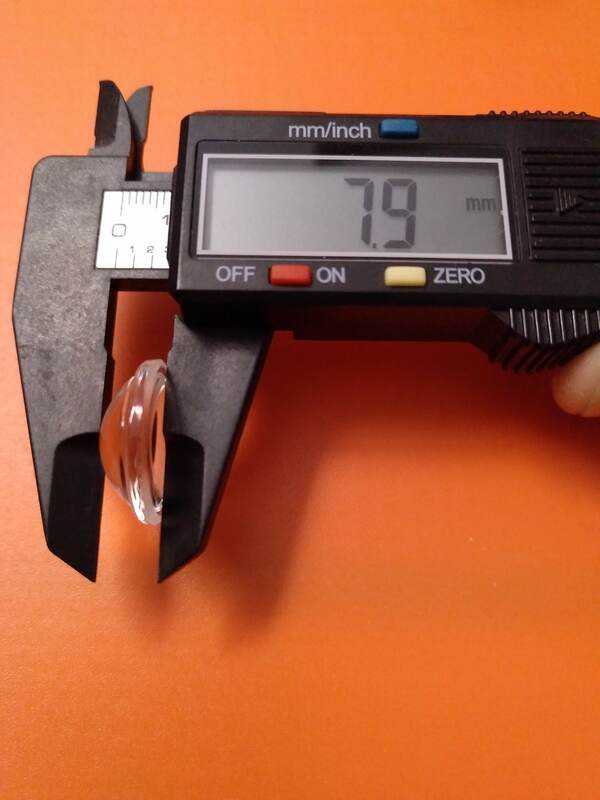 The lens is well made, it is glass not acrylic, so it has good quality! 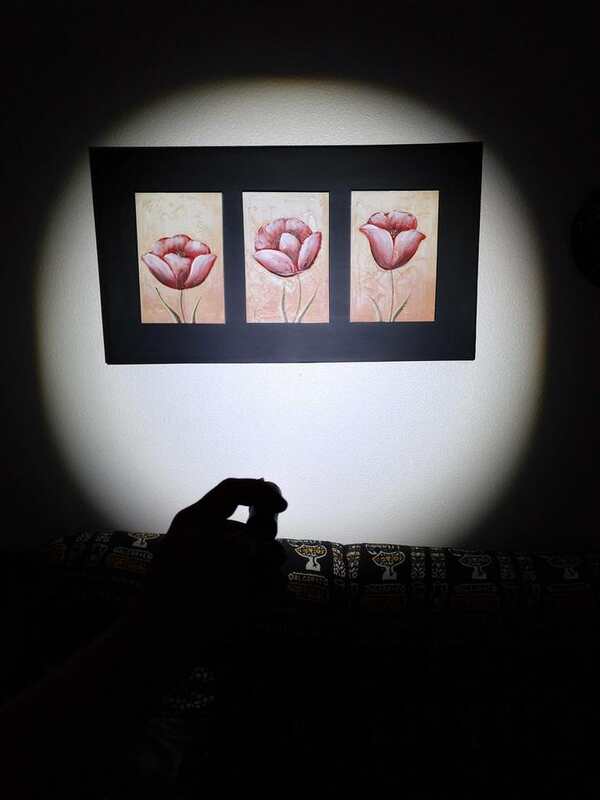 The flashlight allows 1 cm to zoom in. 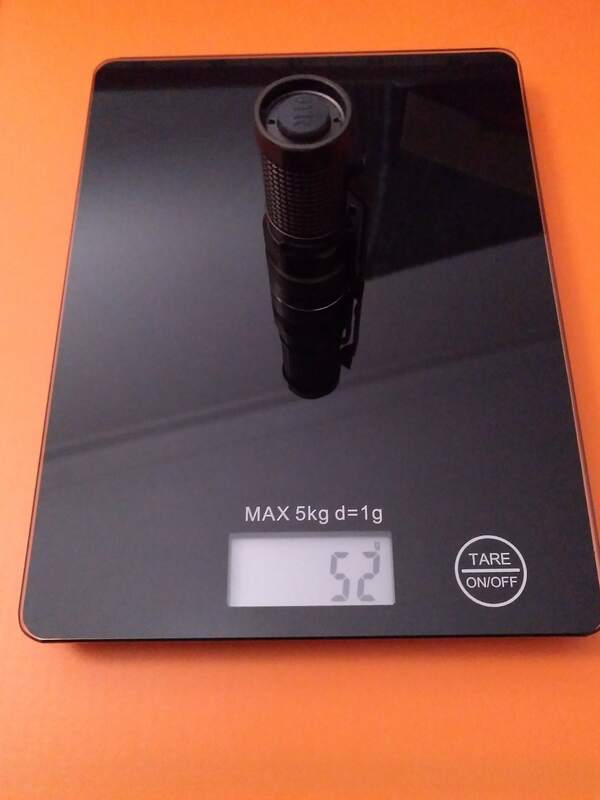 I didn’t mod it yet, but it is on my plans to put a black flat or XPL-HI led on this, I am just waiting to get a nice driver as well, what will take a while (I’ll probably buy from MTN, 15cm driver with guppy3drv). 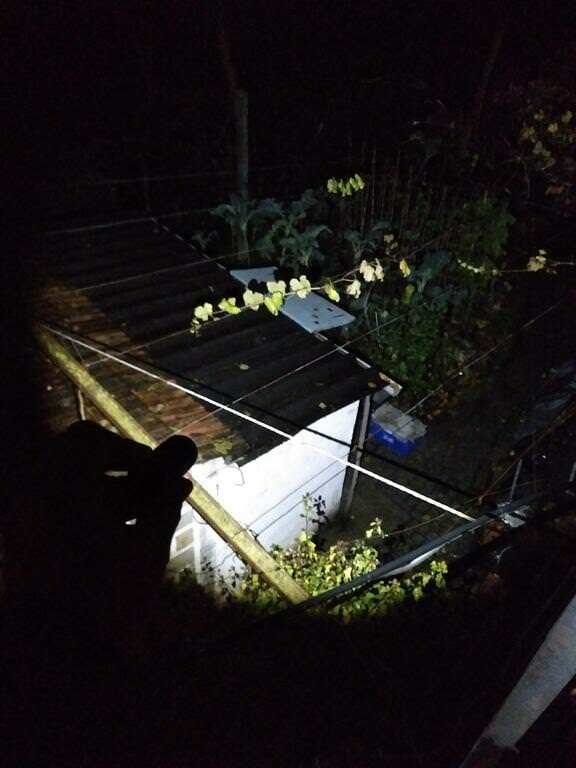 With an XML2 U3-3C, it throws at 45-50m, as shown in the images above (click on them to see a bigger picture)! 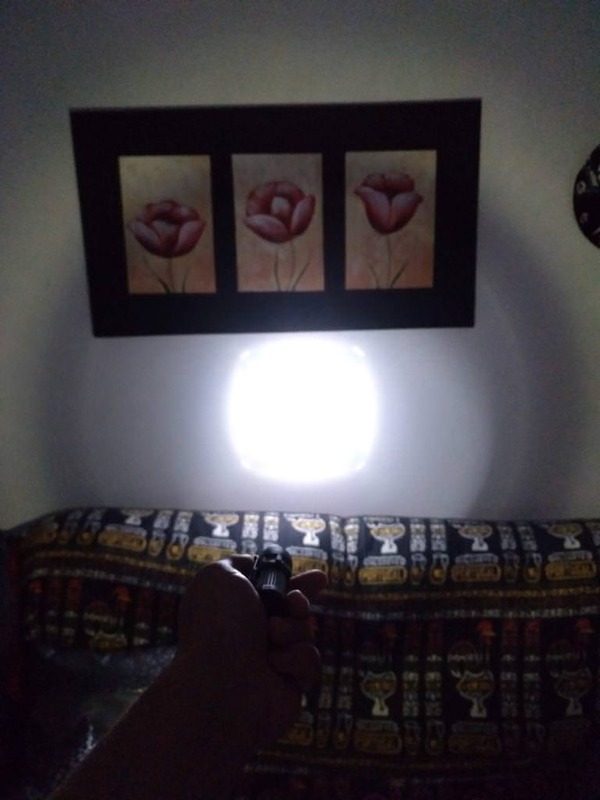 I believe that with some more power and a different LED it will thrown more. BTW, look at the links from djozz mods on post #1, he made some mods back then with an older version! 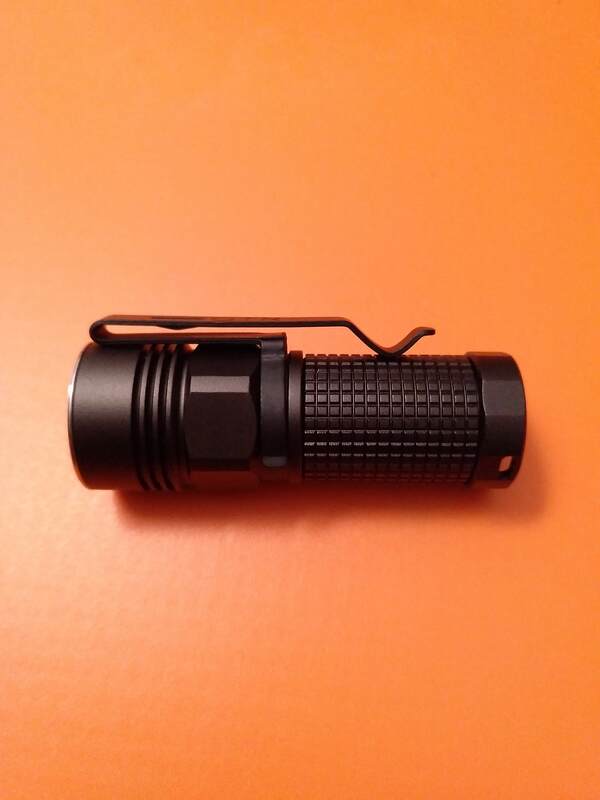 Has anyone seen an 16340 aspheric light with a magnet tail cap (side switch operated)? 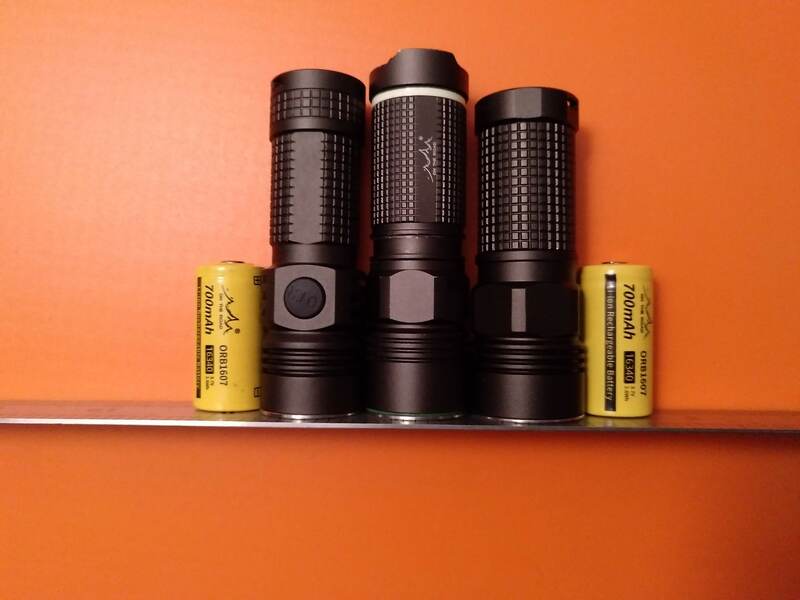 AliExpress has lots of those side switch zoomables to which we can add a magnet on the tail, but those are “crappy” lights! 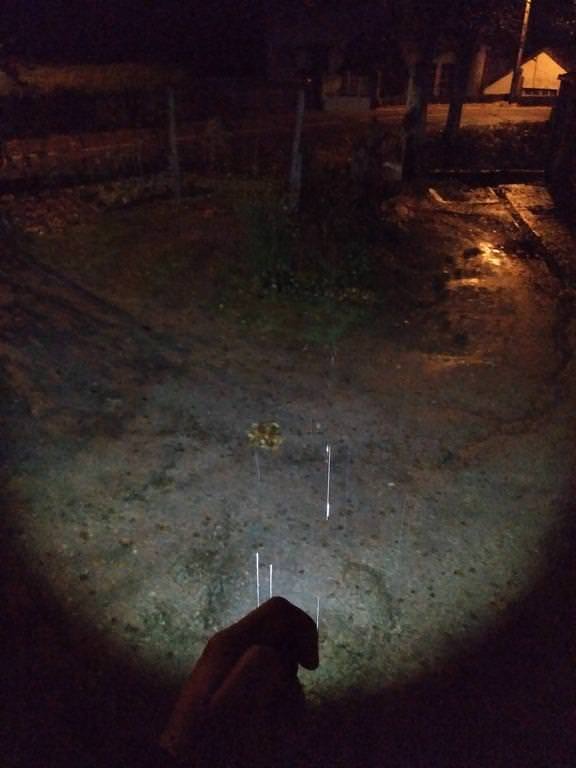 A good light, zoomable with side switch and good UI…is missing! The tail switch on this i3 somehow avoids a longer length that a side switch would require due to a bigger head (to have space to push-pull). 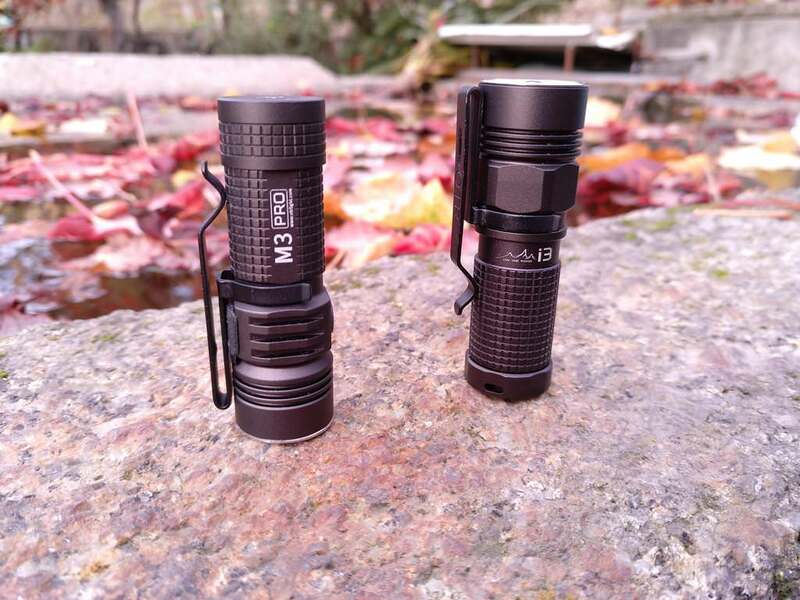 Yesterday I modded the OTR i3 with an XPL-HI U6-1A (bought from Convoy Store). 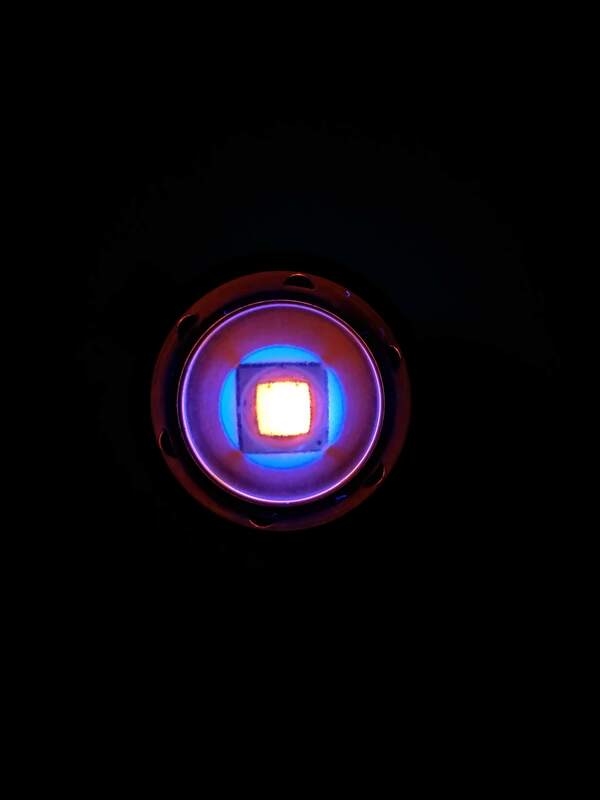 I will mod it later with a OSRAM LED, but didn’t ordered it yet Also, I will mod it with another 15mm driver but…I still need to order it as well! So I kept the original driver, changed the LED and blackened the lens, the “reflector”, the gasket, the bezel and bit of the MCPCB plate with permanent marker! Here are some photos of before and after. 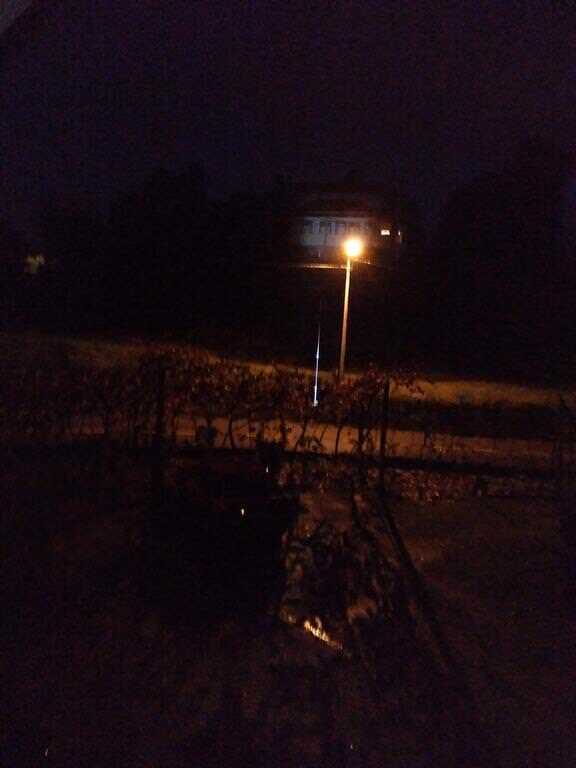 Only tonight I will be able to check the distance it covers and compare it with the previous LED configuration. Nice mod. But XML2 stock looks much better imho. Lets see what other guys think. Hum, can you explain a little better why you think that? 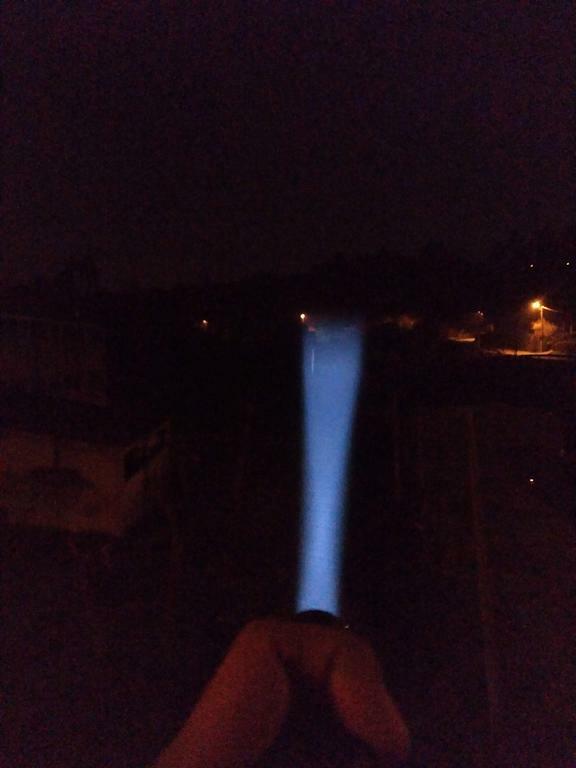 Does it have to do with the beam, colour? Or is it related to what Agro said? Sorry. 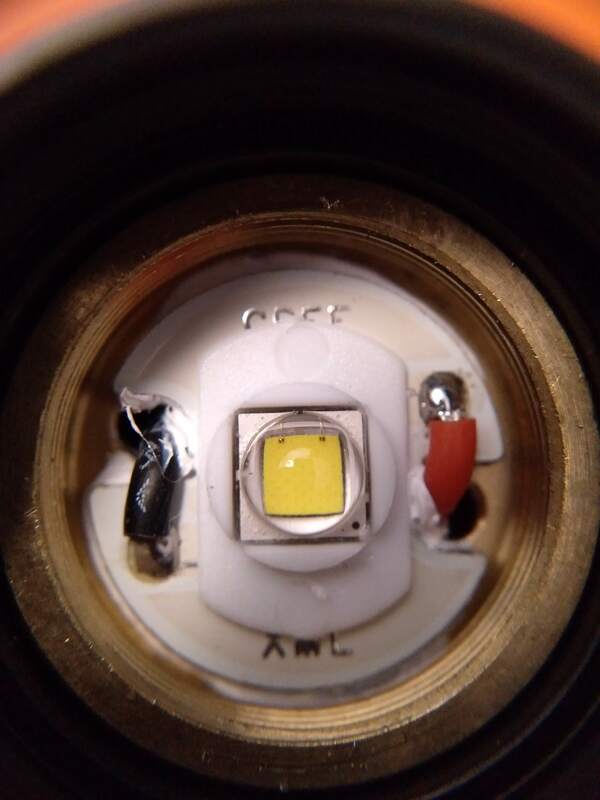 In reality, you can see the LED details, all of them with a good definition! 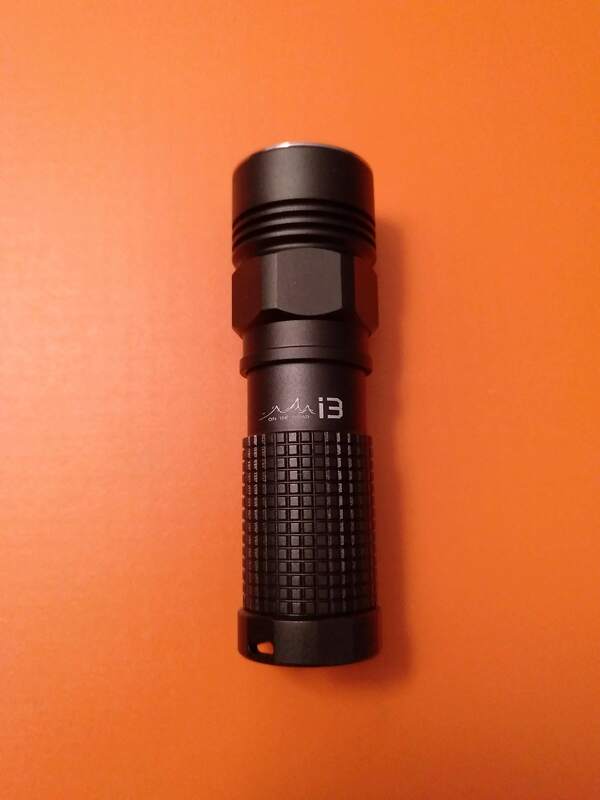 I will tell what I feel about the new LED and the overall mod! 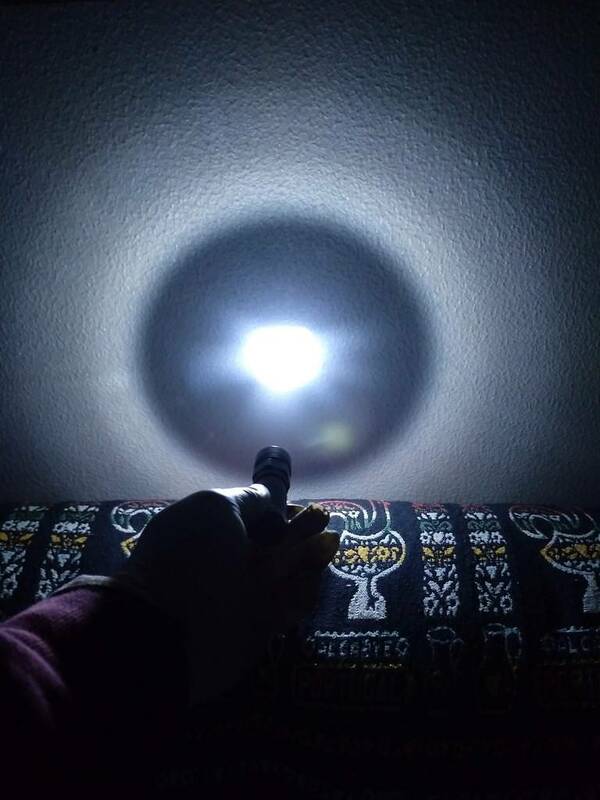 a) The beam while zoomed out is rounder, ‘cause as you can see, with the XML2 sometimes it looked squarish due to the LED+gasket combination. b) The tint is obviously cooler, but I wanted to try the U6-1A because the U6-3A (Neutral White) gave me some tint shifts on the Odepro KL52, so I wanted a cooler tint to avoid that. So far, so good (allied to the other mods, namely the blackening). 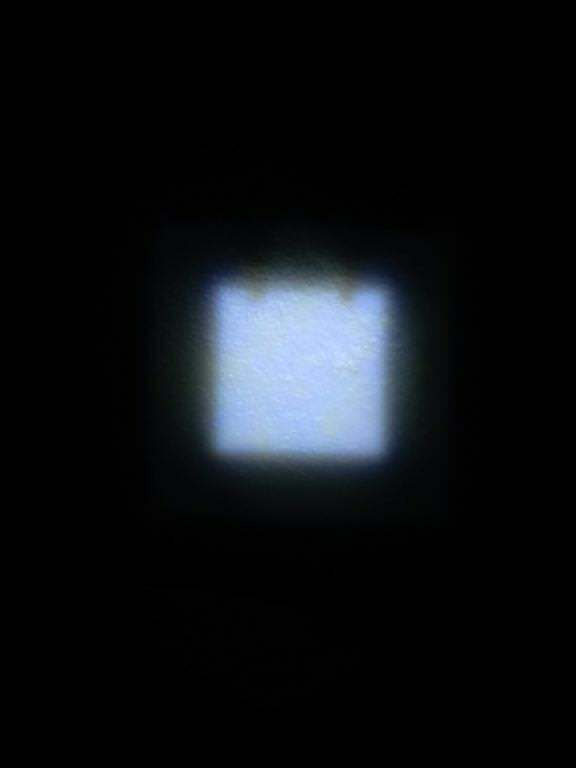 c) The zoom in is very good but some “yellow dots” of the LED can be seen against a white wall/surface, at a certain distance, as seen on the 1st photo (more or less :D) ! 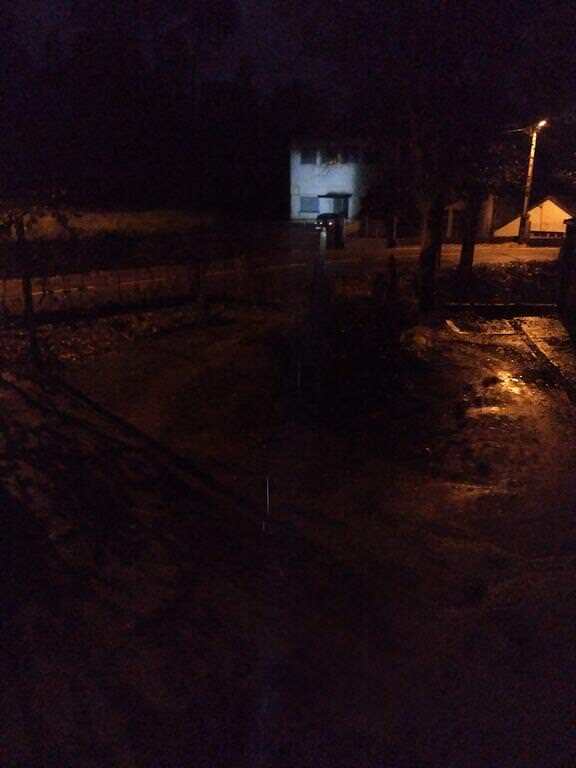 d) Outdoor, I feel like the zoom in functions better with the XPL-HI, while the zoom out worked better with the XML2 due to the tint and eventually the “floodier” beam. 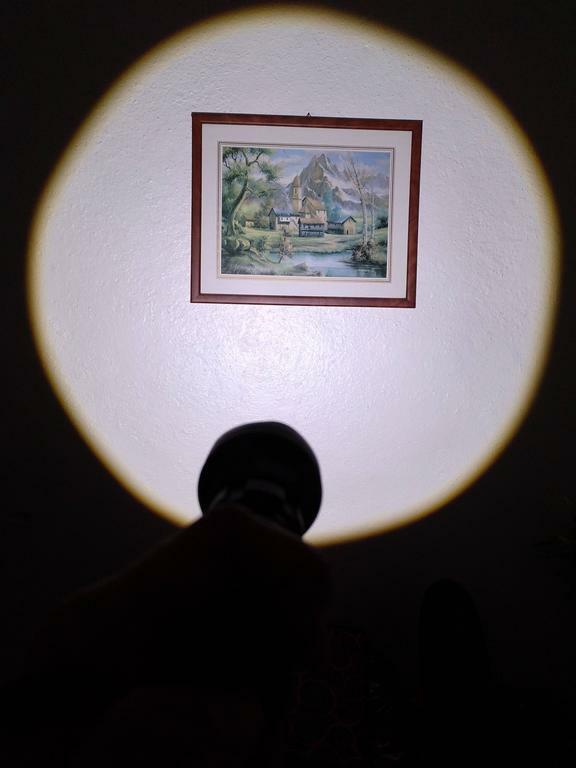 I guess that domed LEDs will work better on the Zoom Out situation! The house (right photo) is at 70m! Feel free to make comments, please!! I wanna improve my skills and mods! 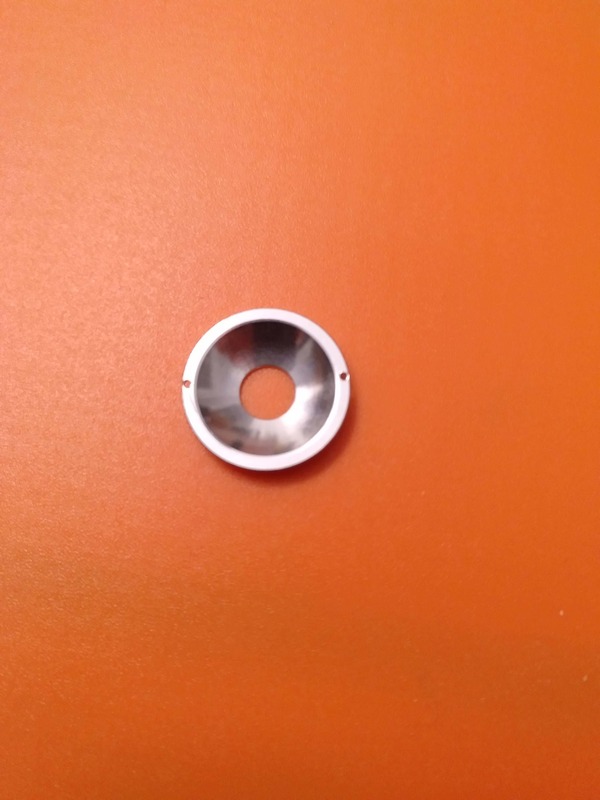 The problem with using XP-L HIs in aspherics is that the flat layer of silicone on top of the die is lit up by the die and shows up in the projected image. 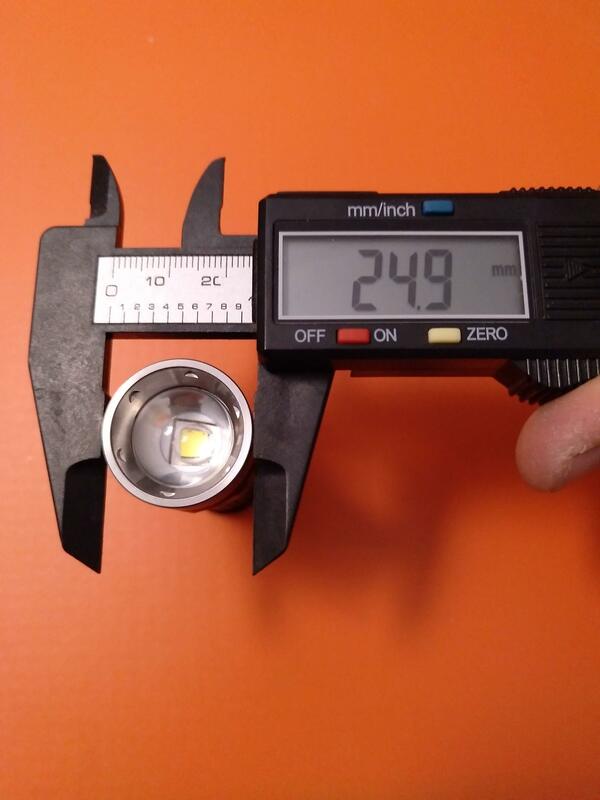 So you have the square hotspot, and then a bigger square which is the whole LED die. 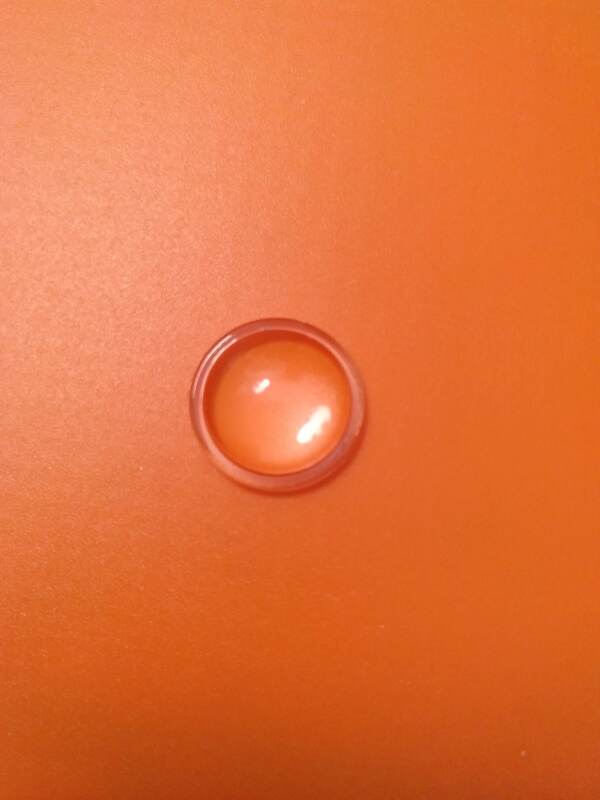 The problem with using XP-L HIs in aspherics is that the flat layer of silicone on top of the die is lit up by the die and shows up in the projected image. 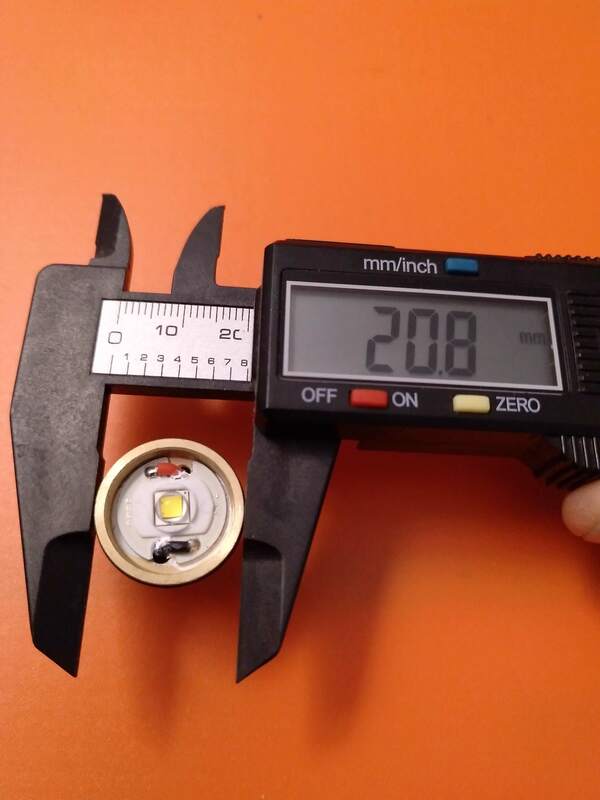 So you have the square hotspot, and then a bigger square which is the whole LED die. 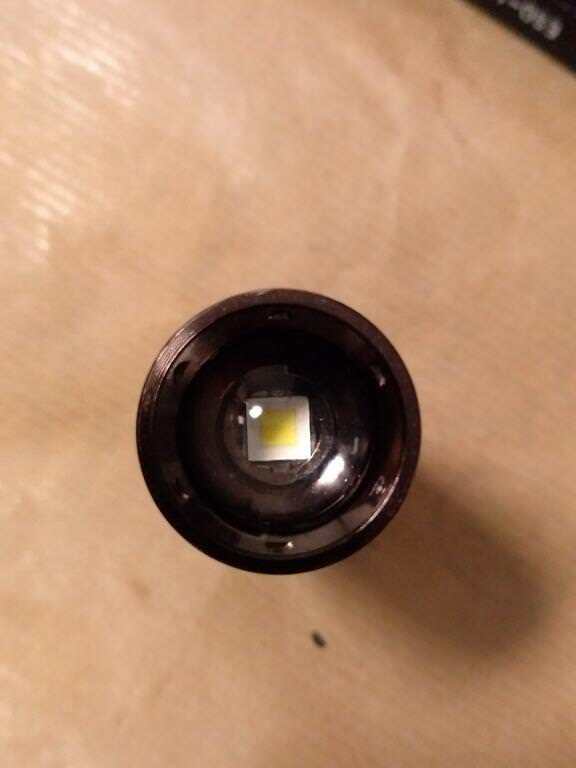 If you want a sharp and super-clean hotspot I highly recommend using a dedomed LED or one of the osram LEDs which have nothing on top of the phosphor Great job though! Oh well, that’s what make that “frame” around the die (in the reflection)!! 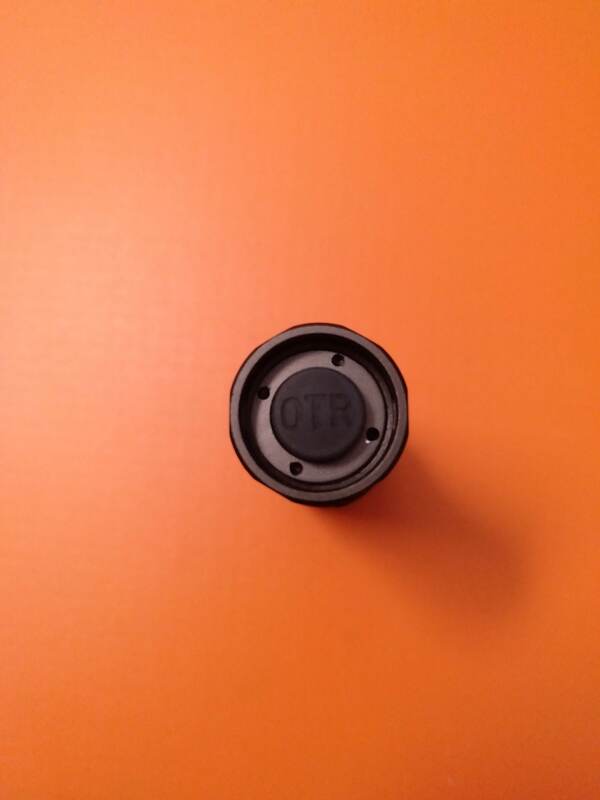 Last week I put a FET + 7135 Driver – 15mm – MTN-15DDm , with Crescendo firmware, in my On The Road i3! 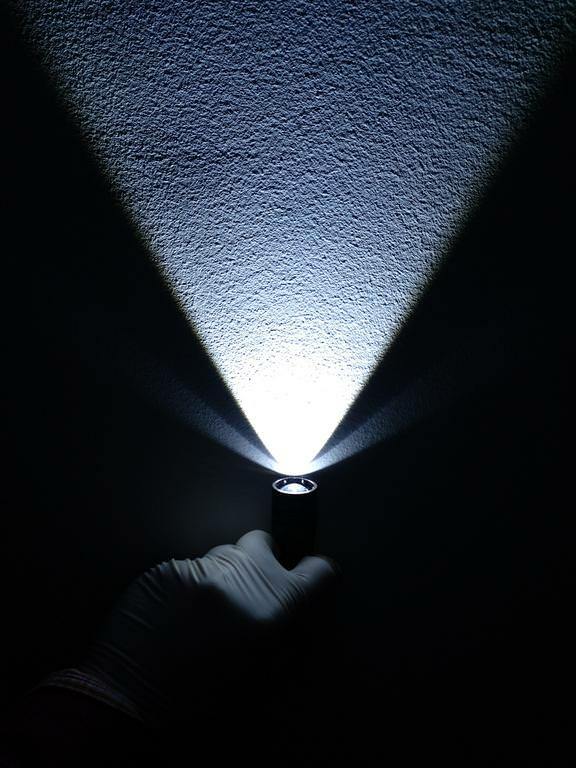 If, on the one hand, the previous UI was less attractive, on the other hand this driver and Crescendo gives this light a better usability and also makes it have better luminous levels, namely a moonlight mode and a higher max output. 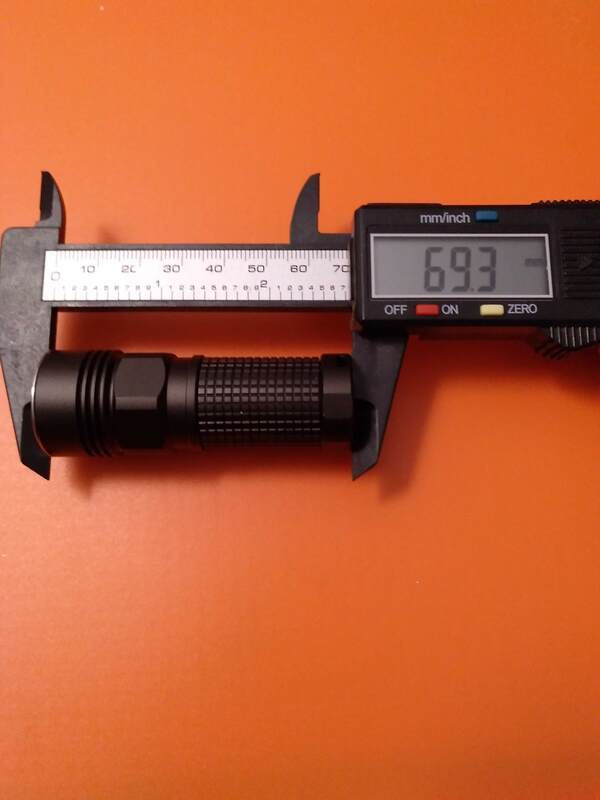 Here are some photos in comparison with the Odepro KL52 (XPL-HI U6-3A + Astrolux X5/X6 Driver) ! 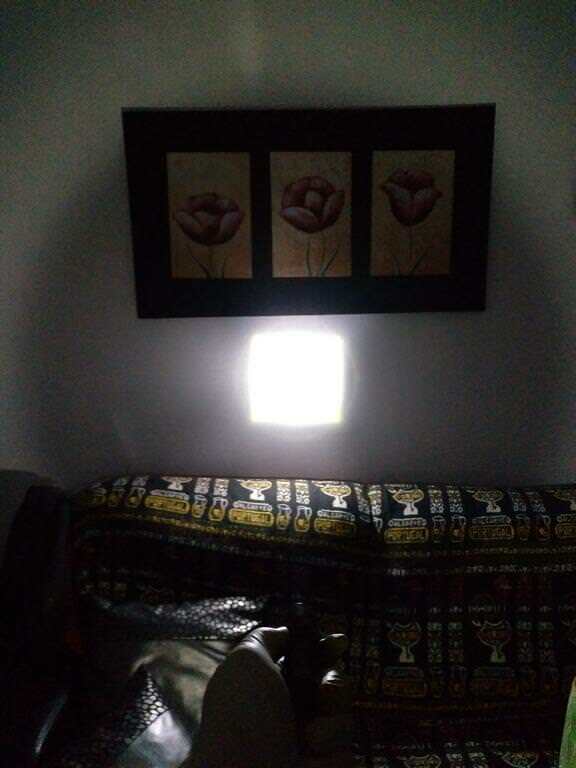 I know you like zoomies too, so I’ll tell you this is a nice light for it’s size. I’ve had a very similar build in my head. Just with high-CRI XP-L HI. Didn’t think about Crescendo but it would likely be a good choice for me. But it’s really a bit large to carry on my neck. I wear Foursevens Mini Turbo sometimes and it’s too large already but I love the punch that it offers. 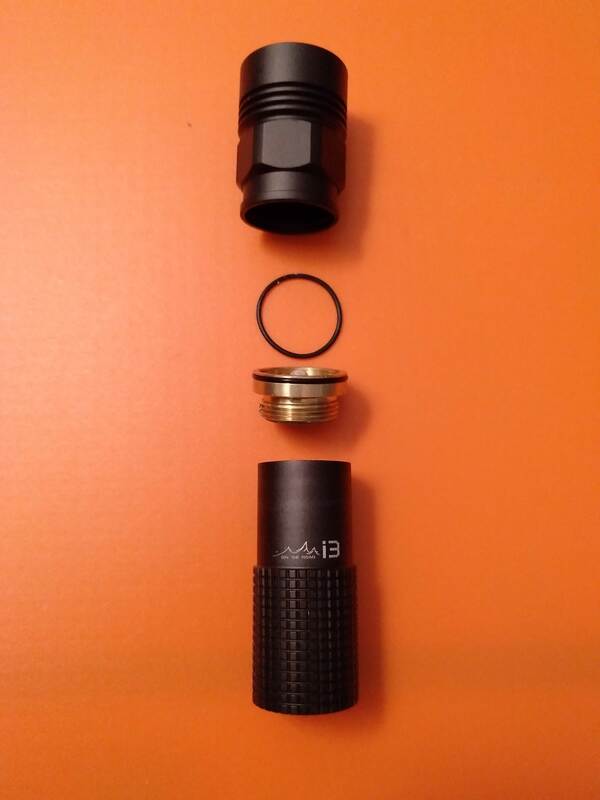 i3 has the same diameter but is somewhat longer…So I’m not really into getting one but it stays there at the back of my head. And if I had one it would surely have its use. Yup, to neck carrying it is quite bulky, the head is large in this light! Larger than the 4Sevens, I’m sure! 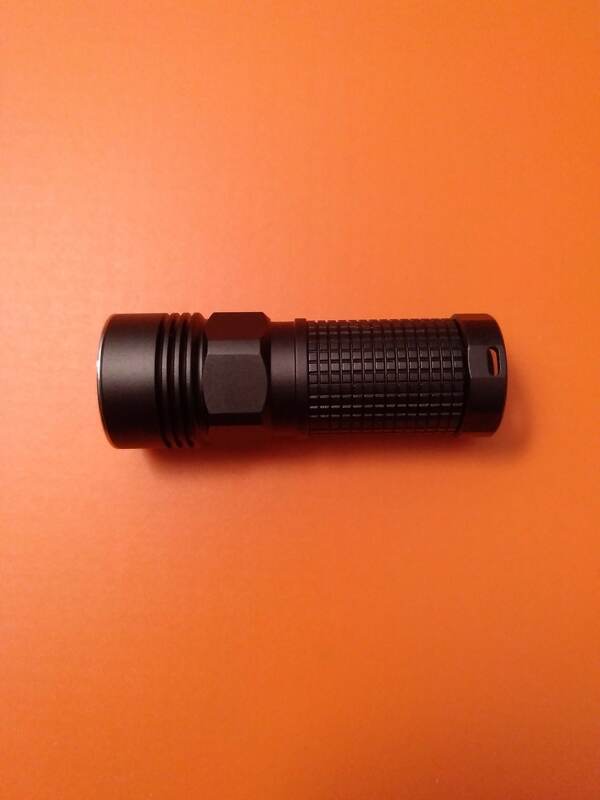 It can be a light to carry in the pocket or jacket, maybe, and that’s the way I’m using it after this mod. 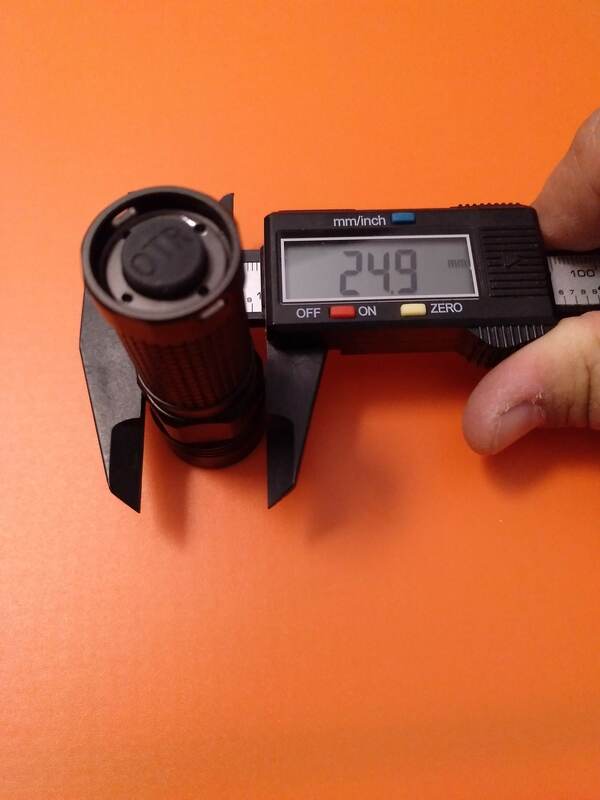 BTW, if you even decide to buy it and change the driver, please be aware that 15mm drivers fit, but only without springs or 7135 chips in the back. 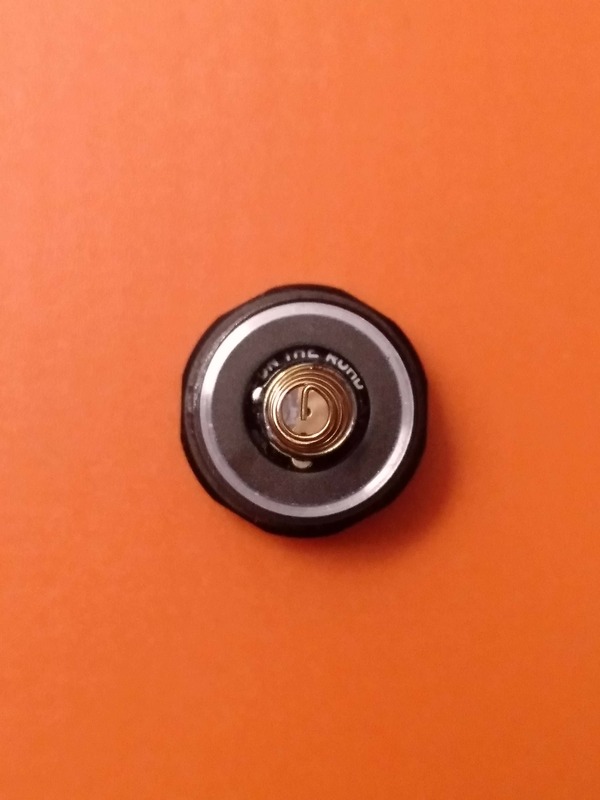 There is small space for the switch spring and the battery itself! 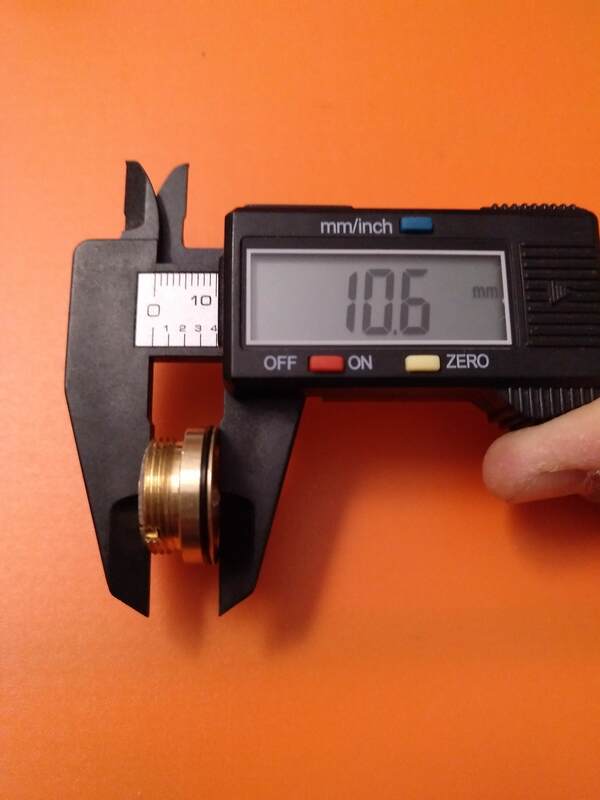 BTW 47 Mini Turbo has one inch diameter. So actually slightly larger than this. Too large to be usable on a short string but if it goes down to my belly – it’s actually OK. Surely not something I would call practical though. Thanks for the note. 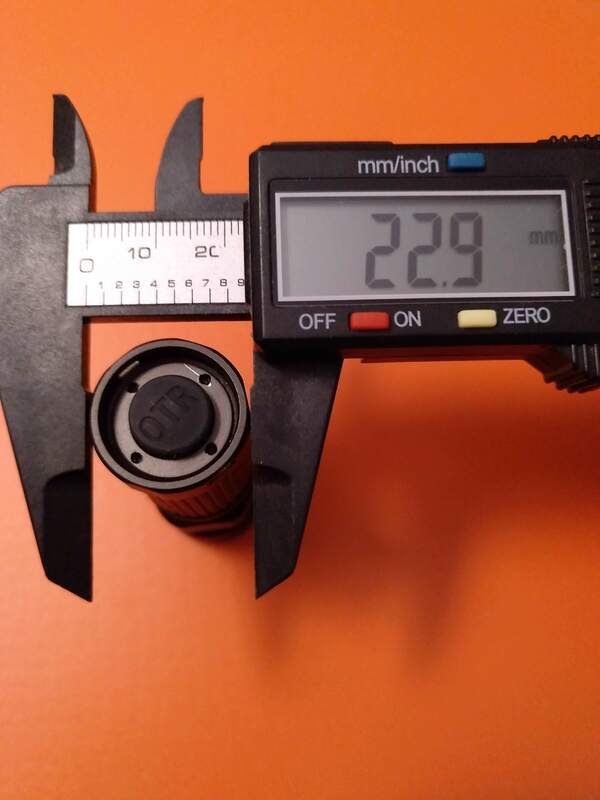 BTW 47 Mini Turbo has one inch diameter. So actually slightly larger than this. Too large to be usable on a short string but if it goes down to my belly – it’s actually OK. Surely not something I would call practical though. They also make a big bulb under the shirt. And can get really uncomfortable while sleeping. That’s the only issue that matters really. 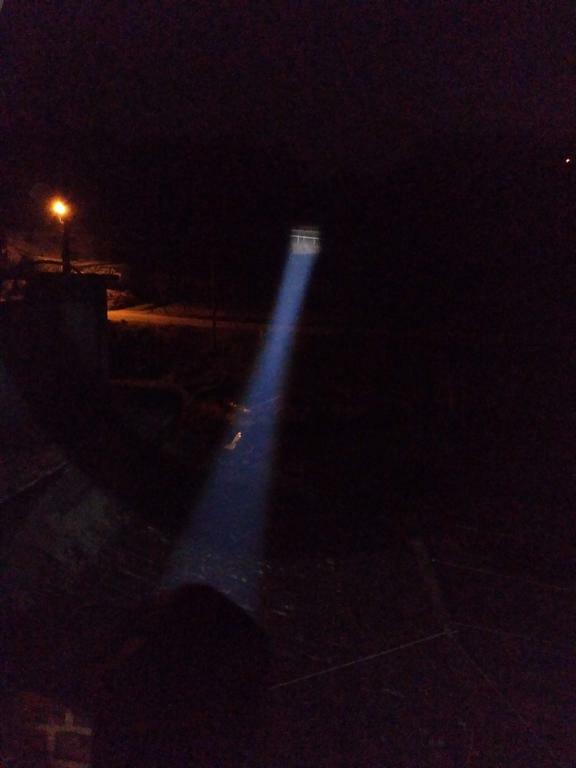 Thanks for the very thorough review and beam shots. 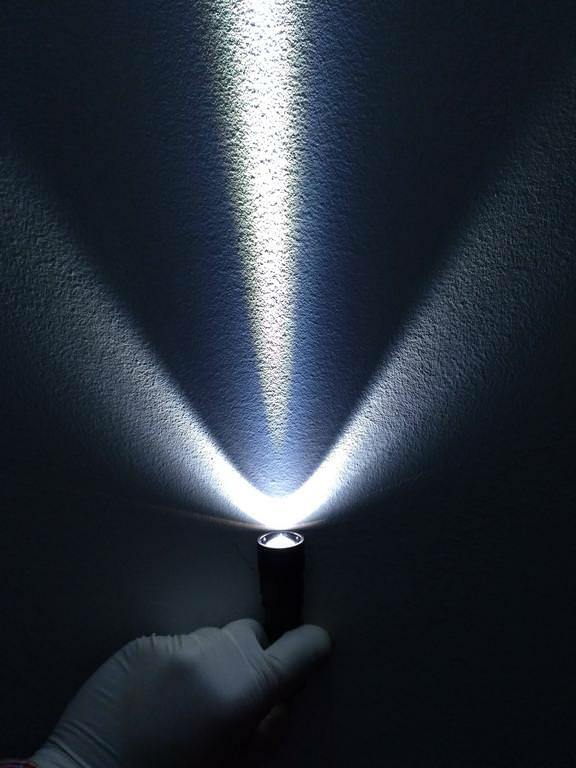 I’d like one of these with high CRI. If I bought one of the existing options, I’d go with neutral. I’d really like direct access to ML from off, regardless of which mode it was in when turned off, but could probably tolerate the current UI. 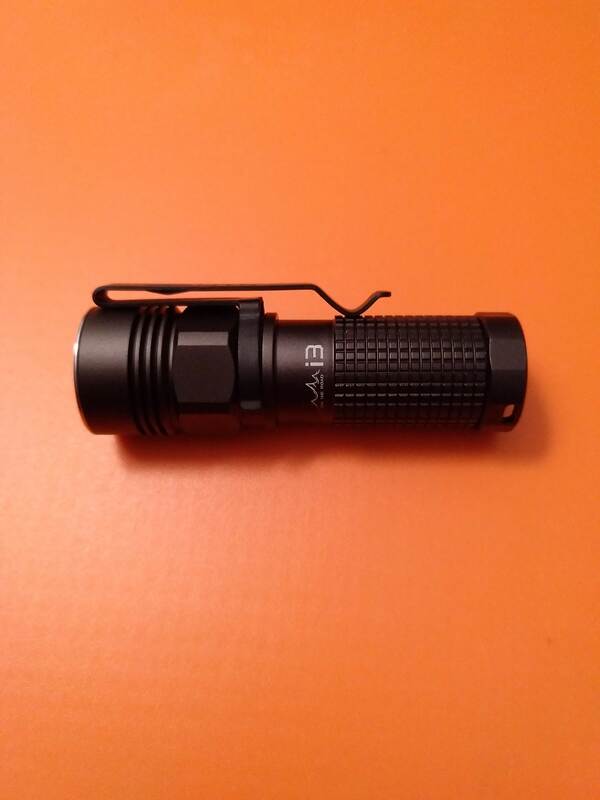 For tint, I’ve come to really like the 3D in my BLF A6. I actually didn’t like much the UI, specially the fact that with some faster clicks to advance modes it would turn on Strobe That’s annoying!